The second weekend in March is an anniversary of sorts for me. 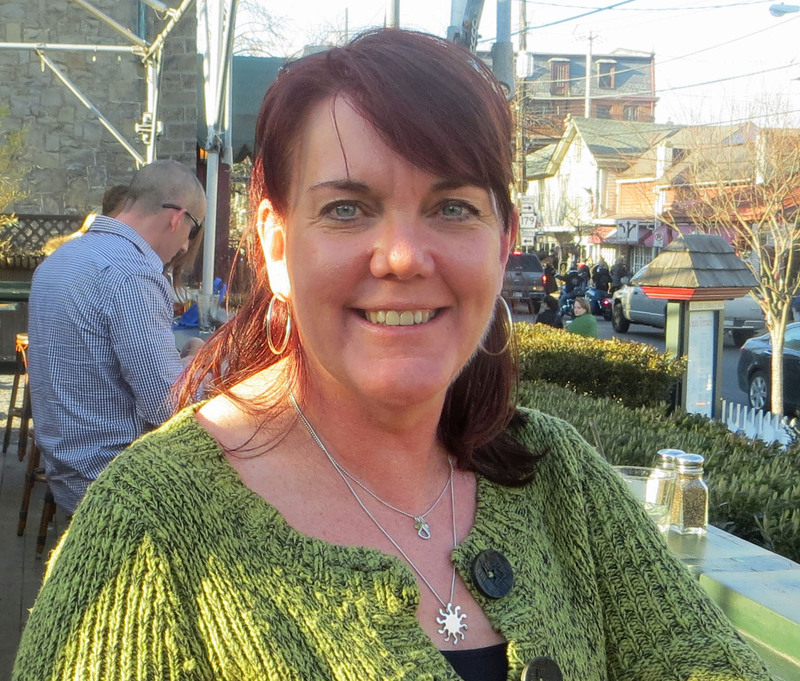 Five years ago was my first visit to New Hope and in many ways it was the first day of my new life. It would be an understatement to say that the move to Pennsylvania was a challenge on many fronts. At that point in my life I did nothing but worry, and in my mind I had a lot to worry about. The company I moved to here to work for declared Chapter 11, the adjustment to living in a new state far away from friends and family caused many emotional difficulties, and the fact we hadn’t sold our house were at the top of the list. It didn’t help matters that we didn’t leave the apartment for anything other than to go to the grocery store or to go to work. I was thrilled when we finally found a dog sitter and arranged to take a day trip. I remember it like it was yesterday. The forecast prompted a last minute change. 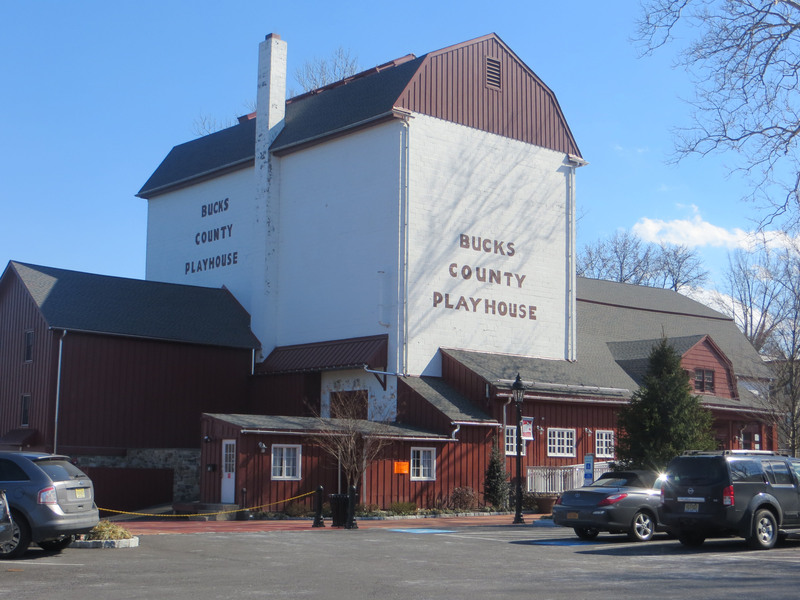 It was a Sunday and we’d made plans to go to Manayunk, PA but the chilly March temperatures, threat of rain, and dog sitter schedule limitations caused a change in plans. Instead we went to New Hope, which is twelve miles away not fifty and going anywhere was better than staying home. All I knew is I was desperate to get out of the apartment. Our first stop was Made In Italy. Elaborate Venetian masks covered the walls, glass shelves held hand tooled leather belts and accessories, and black velvet jewelry busts showed off bright colored beads and bangles. I was drawn to the case dedicated to less elaborate necklaces and fell in love with a solid silver sun with wavy rays. I’ve always had a thing for the sun; it could be because I’m a Leo, but it’s more likely because my favorite memories are made of endless days spent playing in the sun at Big Sand Lake in Minnesota. I started to play the rationalization game to justify the purchase and promised myself that if the necklace was still there when it came time to head home it was meant to be mine. We visited all of the eclectic shops we could and at the end of the day, my mood was lighter than it had been in months, the grey skies parted just enough to let a bit of sunshine and blue sky peak through, and of course the sun necklace was still in the case waiting for me. I put the necklace on as soon as we got in the car and it immediately became a tangible symbol of the promise of a new and happy life. It didn’t seem like a coincidence that the threat of storms changed our destination and led us to a place called New Hope. I wear the necklace as a daily reminder of hope, happiness, and the importance of being me. I also take a day trip to New Hope every year on the same weekend to celebrate life and the woman I’ve become. This year I added a few additional stops to my day. 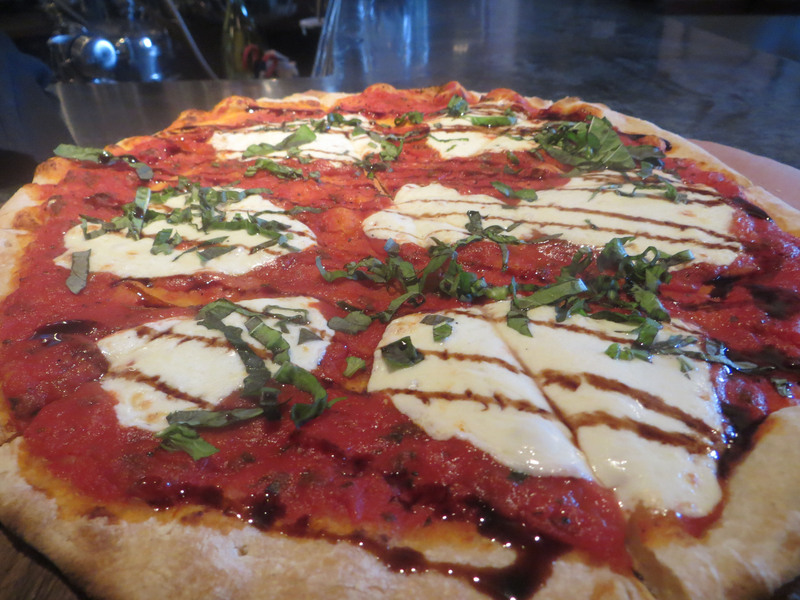 I started my afternoon adventure by treating myself to a few slices of margherita flatbread at a local restaurant called The Vault. I’m not sure why but I find it amusing to think about a micro brewery in a building that used to be a bank. They have great beer that is brewed on site and the food is yummy. You can buy what’s called a Growler and have them fill it with your favorite brew and take it home, it’s re-fillable and they sanitize it for you. I don’t have one, but I’m tempted to make a purchase. I turned right instead of left at the end of East Afton and drove toward my old apartment. 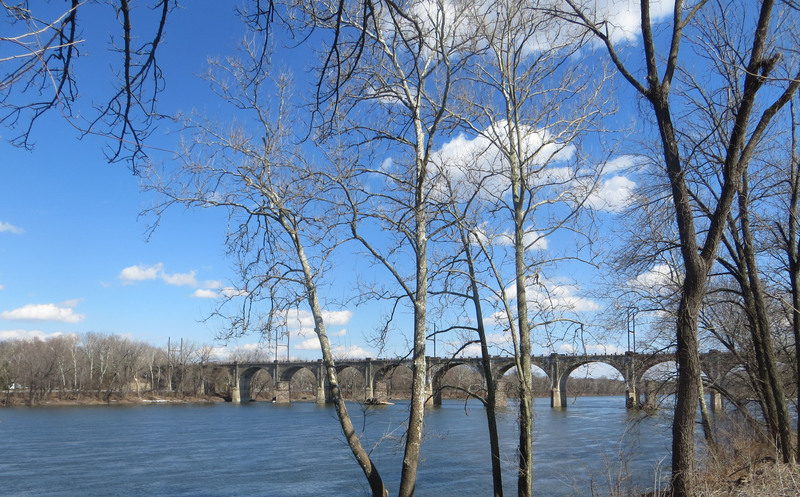 In a moment of impulse I stopped to take a few pictures of one of my favorite views of the Delaware River. Feelings of relief, happiness, and accomplishment came over me as I drove down the street toward my old apartment. The two years I lived there might possibly have been the most difficult time in my life. It was also life changing in ways that have turned out to be amazing. I took a picture of the apartment building, but deleted it. Instead I chose to remember the gateway leading to the Delaware Towpath. 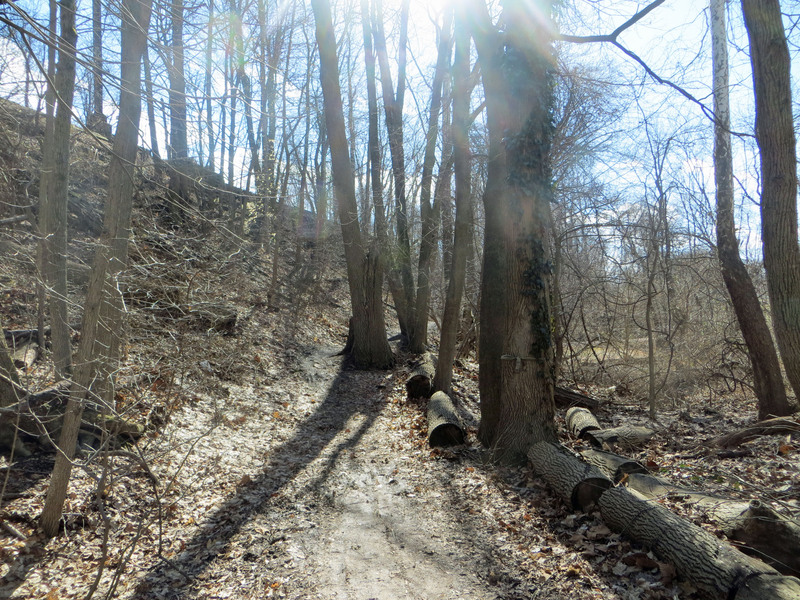 I’ve spent countless hours on the towpath running, riding, taking pictures, and thinking. Lots and lots of thinking and also a few life changing and difficult conversations. 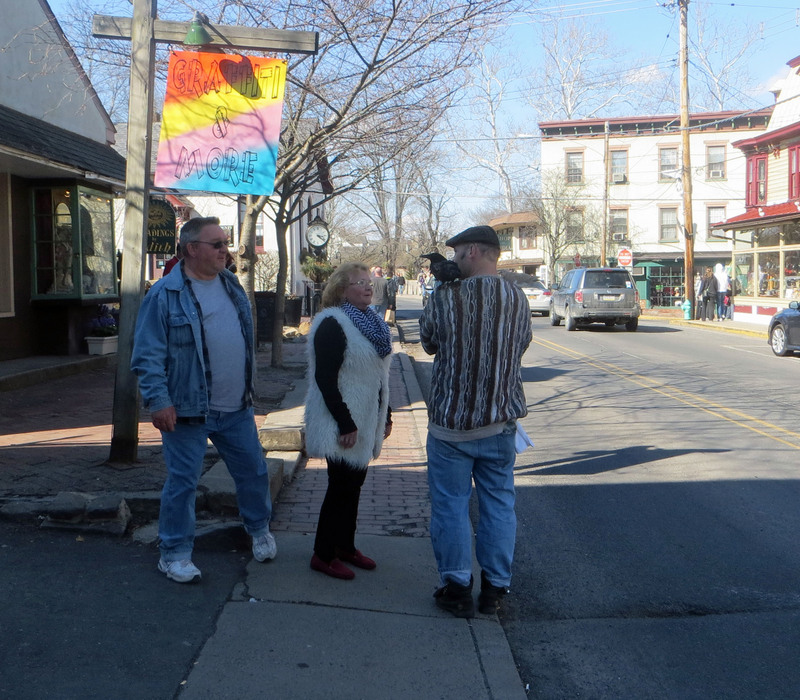 My first visit in New Hope was to a psychic. 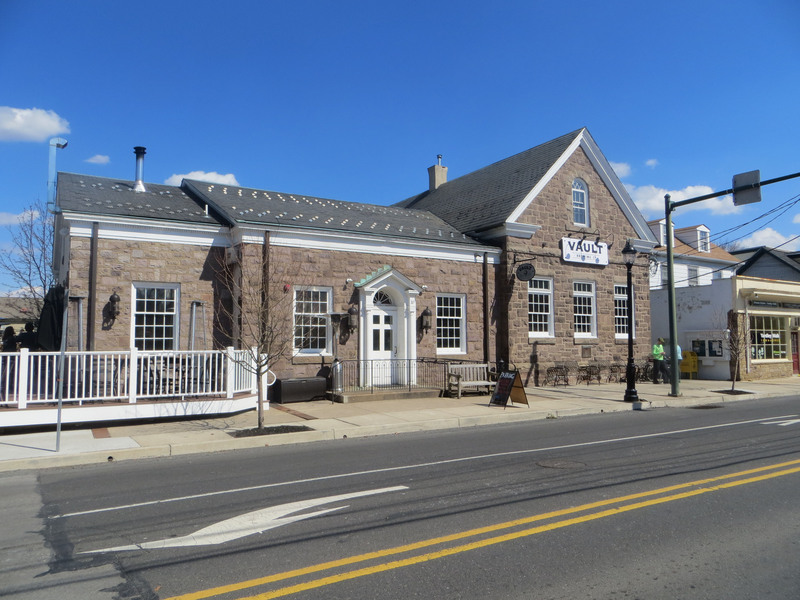 There are almost as many psychic’s in New Hope as there are restaurants which has made it difficult to choose one. 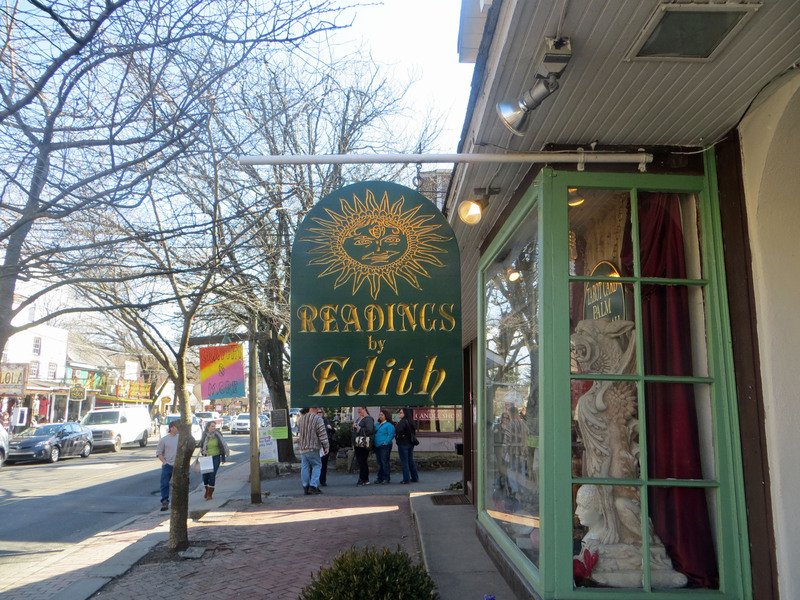 I finally decided on Readings by Edith because of the golden sun on the sign. The funny thing was that Edith turned out to be a 300 pound man. He happens to be Edith’s son, but I still found it amusing. He does palm readings, tarot cards, and has a crystal ball. He read my palms using a large magnifying glass and I have to admit even I was surprised at the details the tiny lines revealed. I wandered through several of the stores. 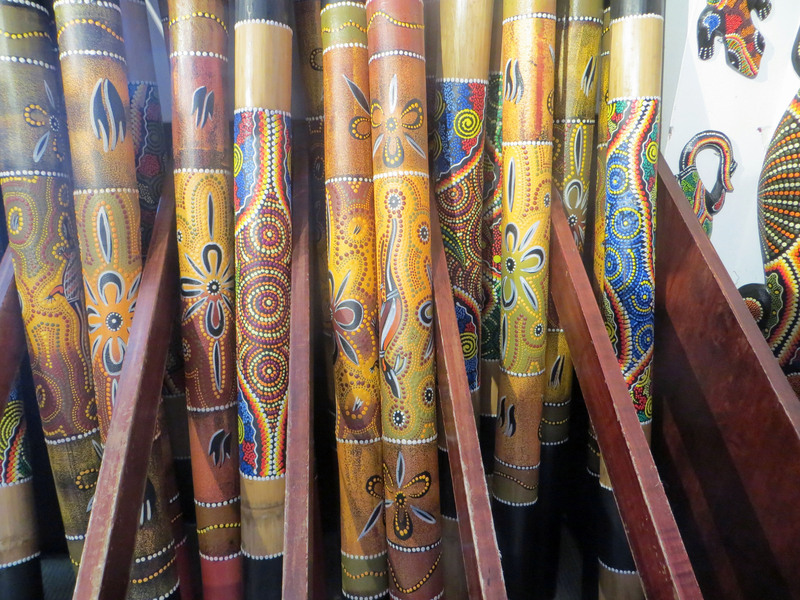 The doodle designs on these sticks were fun and reminded me of the many ways that art comes into our lives. I ended my day with a glass of wine and a bowl of French Onion soup. I was lucky enough to get a bird’s eye view of the street from the restaurant’s outdoor patio. New hope has to be one of the best places in the world for people watching. My favorite from yesterday was the bird man. He walked around the street with his Raven and another unidentified bird on his shoulders. Of course I wouldn’t go near him for fear that one of the birds might decide to leave his shoulder and hover over my head. I wonder how many times he’s shared the story of his birds with strangers on the street. My day of celebrating life ended on a perfect note and I completed the first version of my second grade art girl dress. It was a great day of celebrating life and being myself. 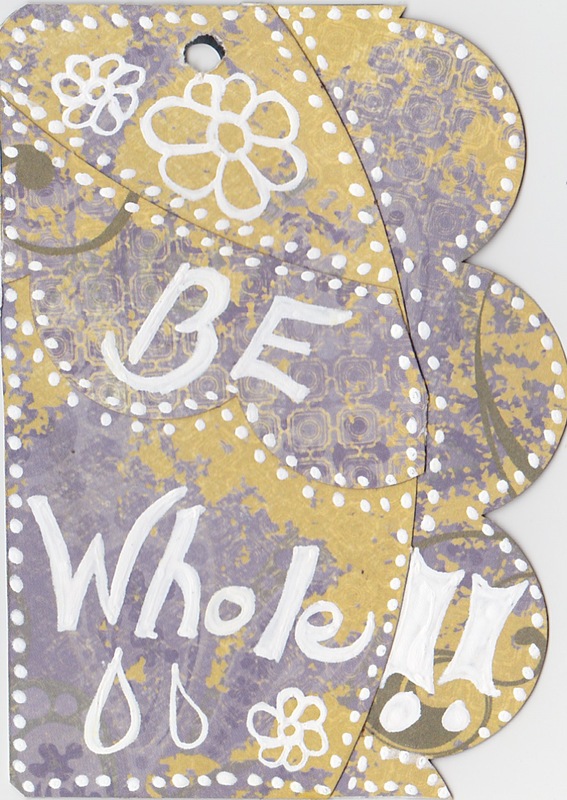 The last thing I expected when I started the Doodle Arts and Lettering class was for it to remind me of lessons I learned from the book Walking in This World by Julia Cameron. Lessons like the importance of staying in touch with your inner child. It’s odd that as we “grow up” we lose the confidence and hope we had as children. Too often it’s replaced by fear of failure and self limitation. We forget to celebrate the little things and dwell over the mistakes we make for far too long. 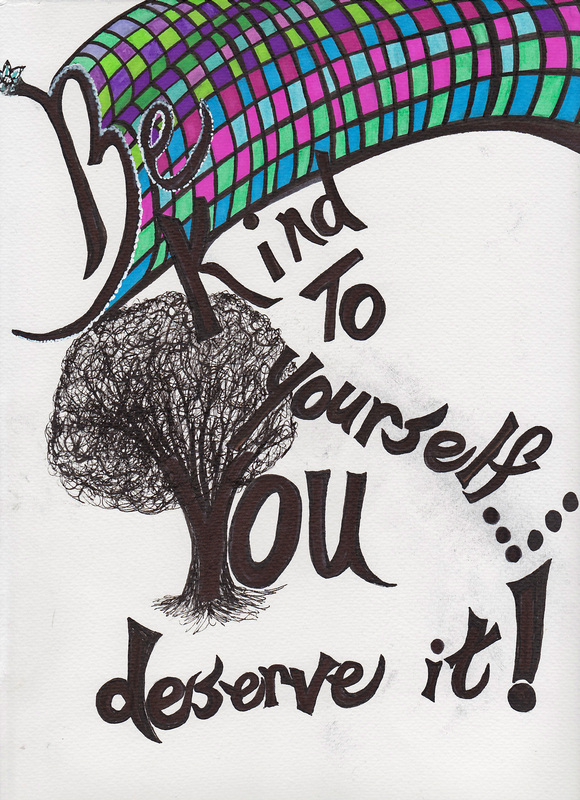 Many of us compare ourselves to others and let self-doubt hold us back from creating. If we’re aware of it, it is possible to tap into the spirit we had as children and believe in ourselves and what we have to offer the world. I have to admit that I wasn’t looking forward to the second lesson and drawing a whimsical dress to represent a second grade girl. My drawing style isn’t whimsical or cute and I was tempted to skip it. As it turns out, I’m glad I didn’t. I was hooked as soon as the instructor explained the reason she wanted us to draw a symbol of a second grade girl. In second grade is that we had no fears or limitations, we just had some skills believed anything was possible. 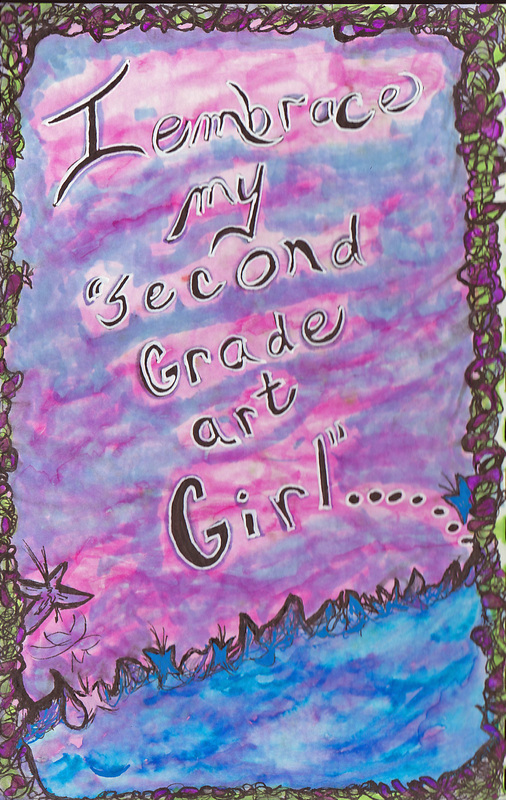 “Embrace your second grade self.” What an interesting idea not only in art, but in life. 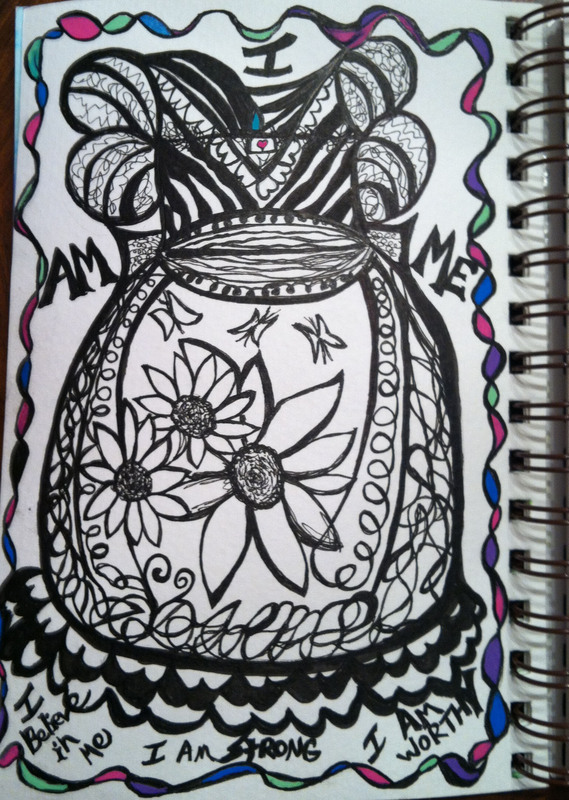 The assignment might be to draw a whimsical dress, but the lesson is something completely different. 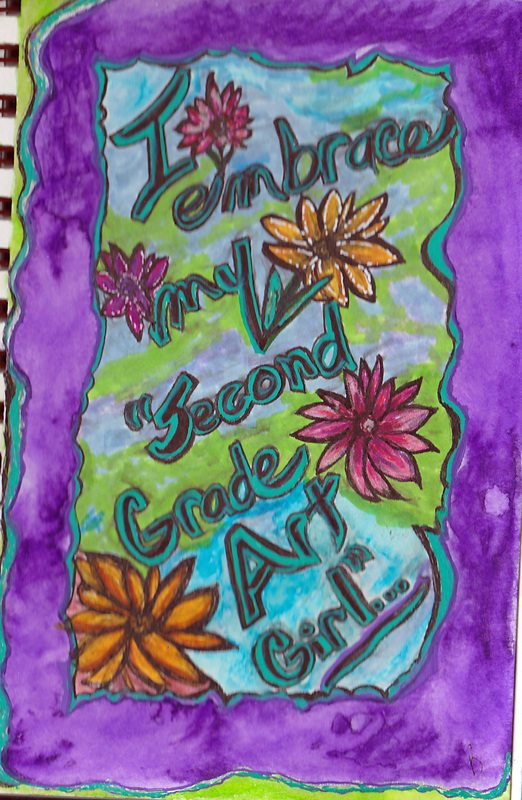 The first step was to create an entry with the phrase “I embrace my second grade art girl,” written in it. I’m not sure why, but I knew that it would take me more than one attempt to complete this part of the lesson. 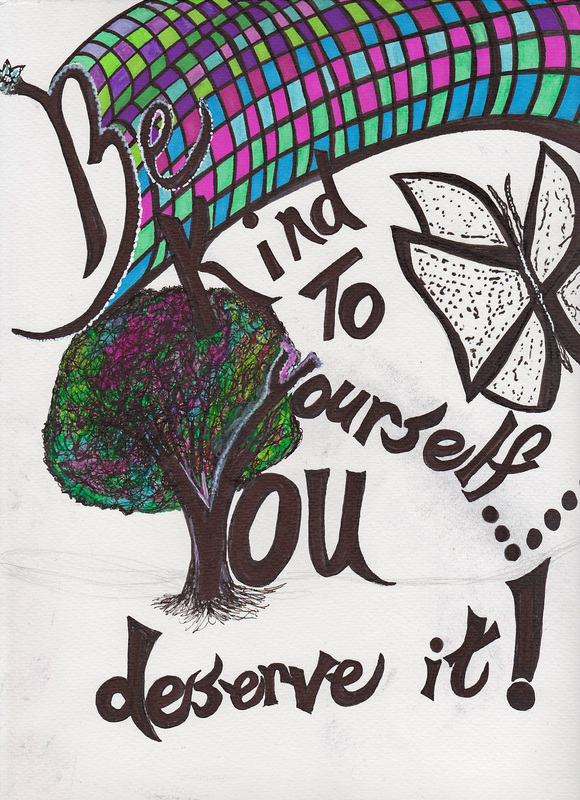 Not because I was trying to be perfect, but there were three versions of the drawing inside of me. I painted the background blue and green for version 3. 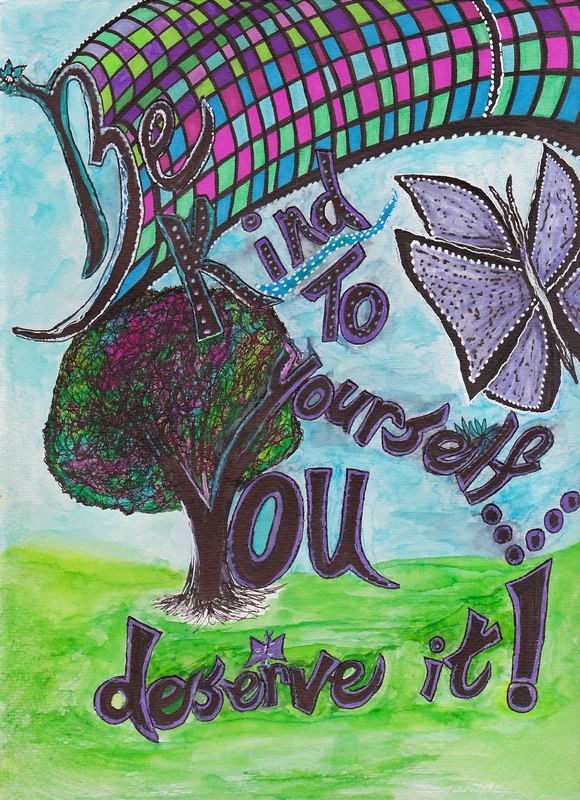 The purple background is for the next part of the lesson which is to complete the entire phrase. A friend of mine always says that what I draw symbolizes something inside of me and I think that may be true. The past several months have had their challenges and it’s been difficult to remember to take time to look at life through childlike eyes. The Doodle Arts lesson has been a good reminder that each step of the way I am gaining more confidence in myself and my future is bright. I’m now looking forward to drawing the dress. I don’t know how “whimsical” it will be, but I know it will be mine and I will embrace the symbol of my second grade self. 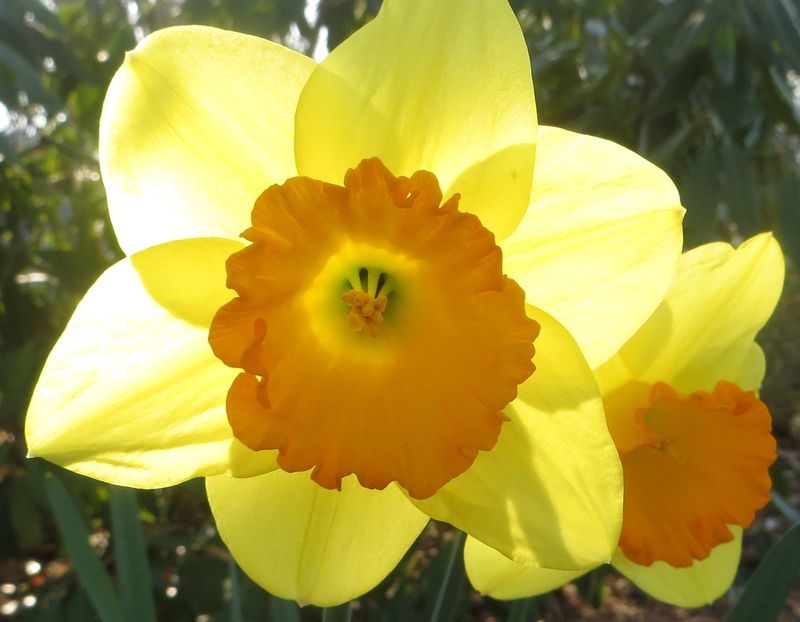 It’s been an Artistic Winter, but – Is it Spring Yet? Holy buckets I’m tired of winter! I will say that this winter has been very good for one aspect of my life. 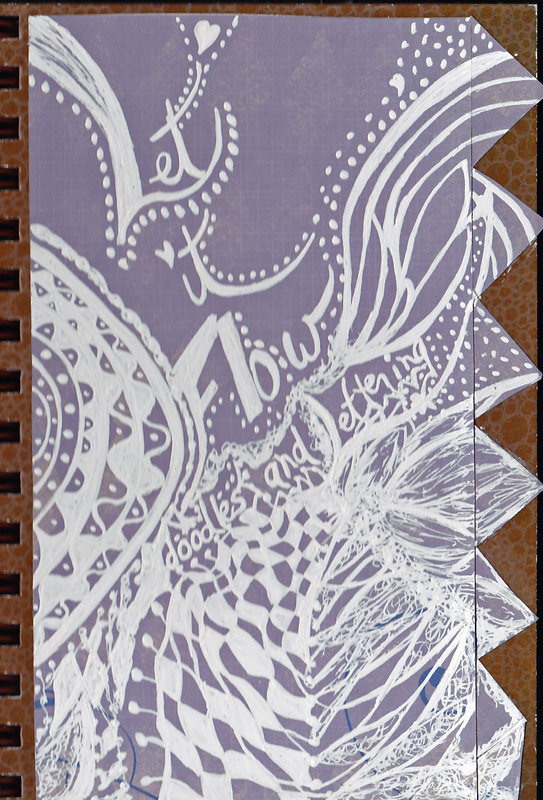 The long winter nights have been conducive to spending quality time with my ink journal. I’ve also joined a couple of artist’s groups on Facebook which has turned out to be both fun and inspiring. 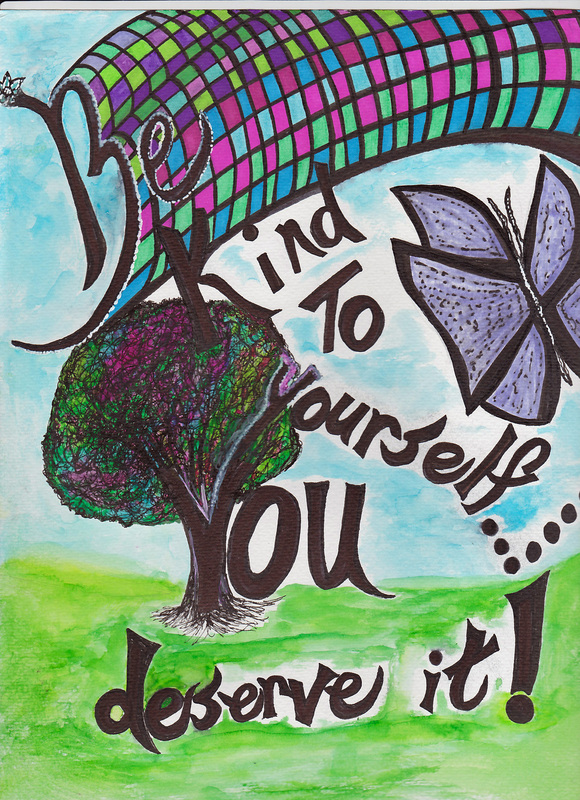 I’ve met some great people and it’s fun to sign onto Facebook and see the latest ink journal entries, doodle art, and mixed media pieces. There are so many amazing artists in the world, it boggles my mind. 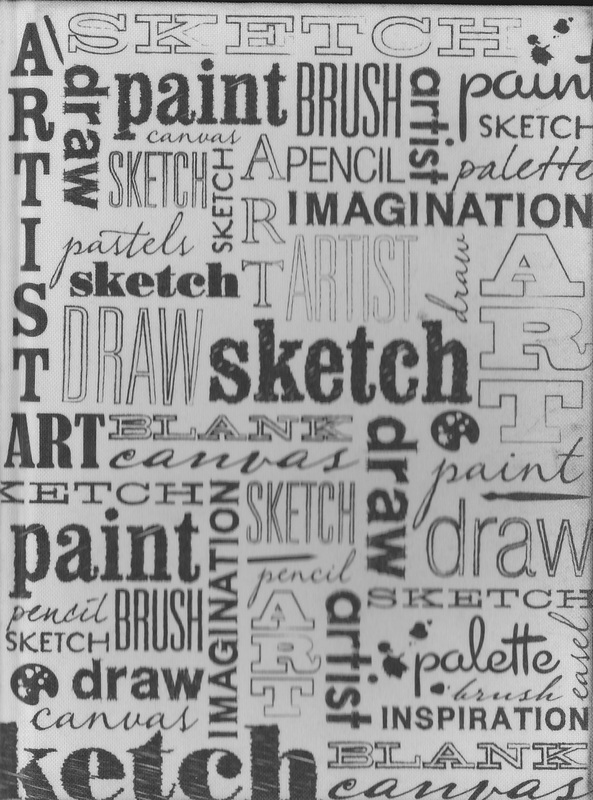 When I started drawing in my ink journal, I called each entry a ‘doodle.’ What I didn’t know or appreciate at the time is that doodles aren’t just the shapes someone draws on the edges of a notebook while they’re waiting for a boring meeting to end. 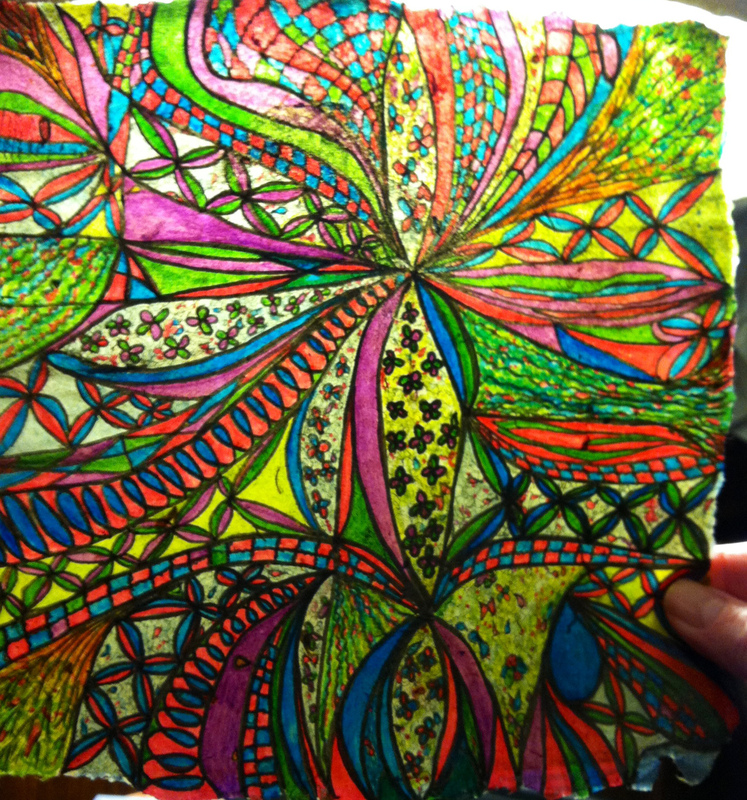 Doodling is an art form and an excellent way for me to relax. 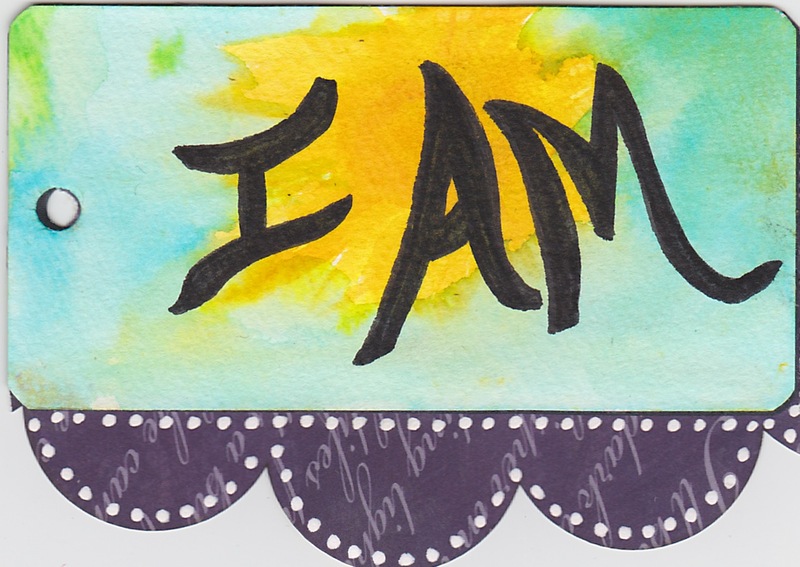 I learned about an online class called “Doodle Arts and Lettering” through one of my new Facebook groups. On a whim I registered, bought the supplies, and started the lessons. 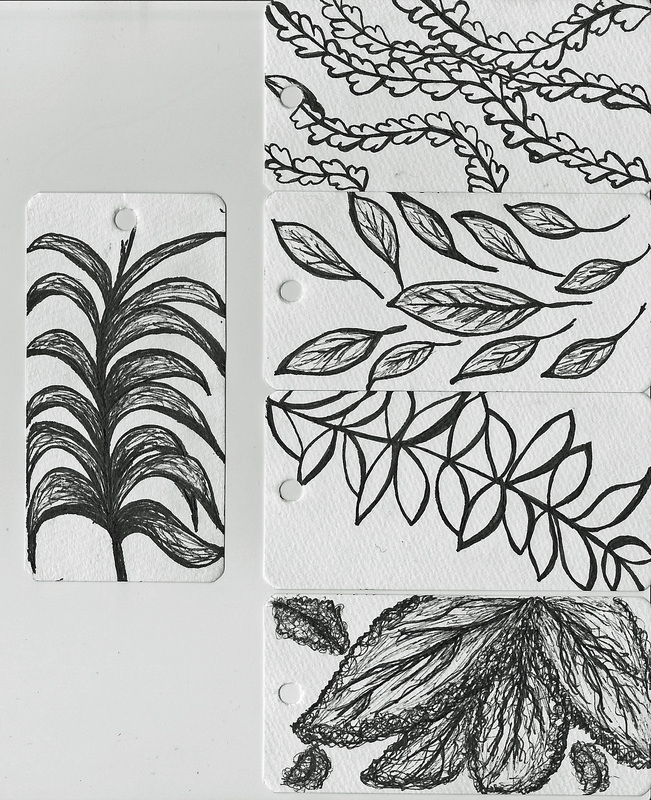 Each lesson includes an extra doodle assignment at the end, the first one was to draw nature, specifically leaf inspired doodles. 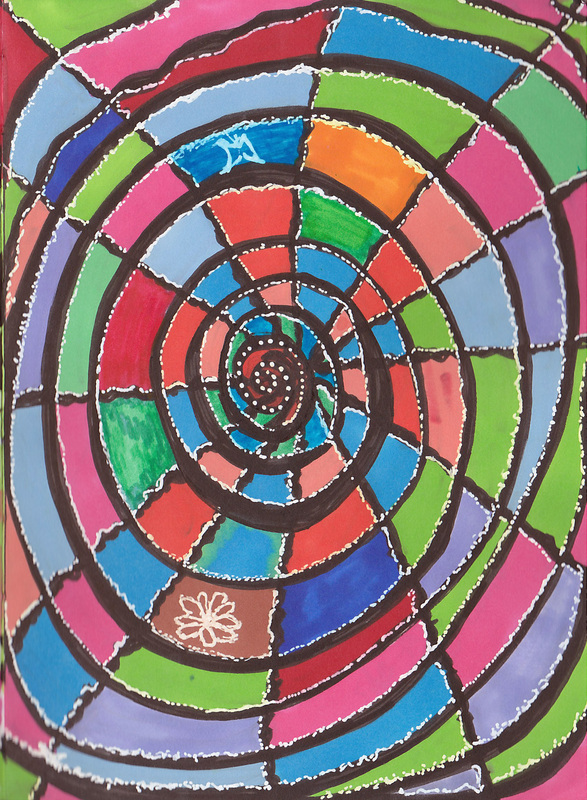 The drawings for each lesson will be completed in a journal. 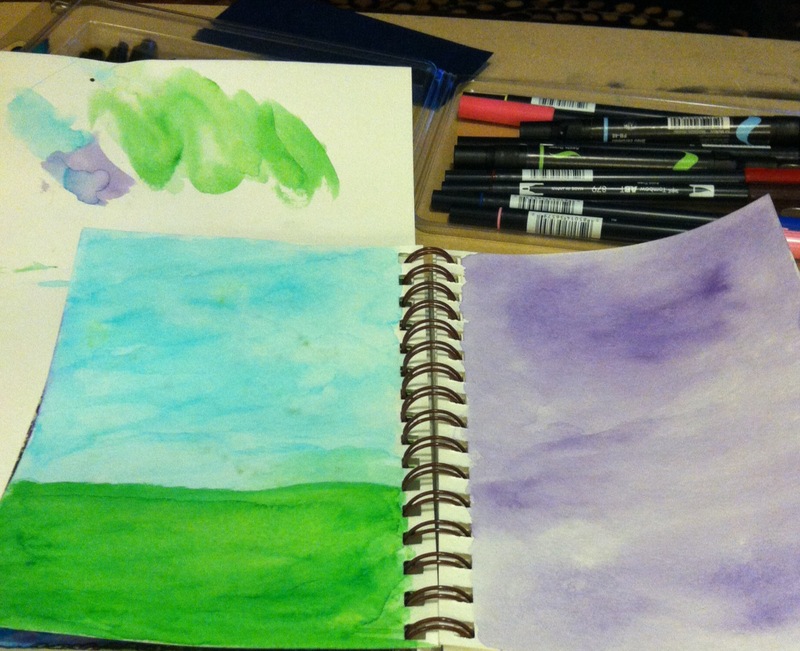 I’m using a small journal with watercolor paper. The assignment to create cover art was a little intimidating, but I’m pleased with how my cover turned out. An interesting and unexpected outcome of participating in the online groups is an increased feeling of confidence in my own artwork. It’s freed me to try new colors and combine techniques and to use real life as inspiration. 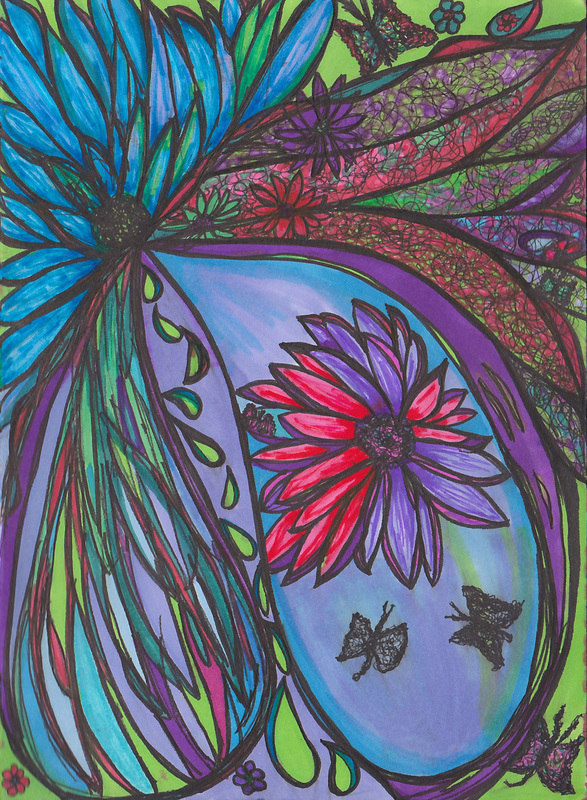 The bright yellow, blue, and purple sunflower bursts pop out of the background and remind me of creativity and ideas bursting out of an imaginative mind. 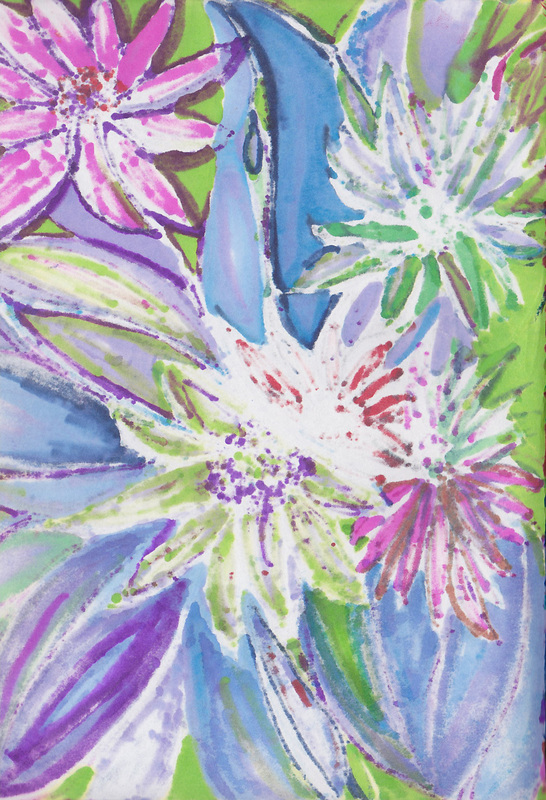 Participation in the groups and the online class has fueled my courage and my imagination to go beyond drawing flowers and experiment with new ideas. 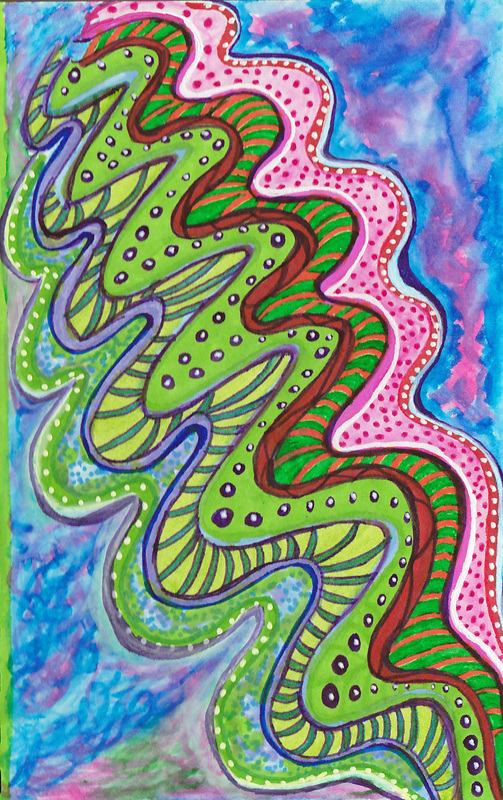 This drawing started out as 4 wavy swooshes and it somehow turned into a psychedelic serpent or snake. I’m guessing it’s not what most people would expect to be on the page behind the “Let it Flow” cover, but it is and I think that’s quite cool. Another interesting thing about keeping an ink journal is that I can’t wrinkle up and toss aside the drawings I start and don’t like. They stay in the pages of my journal and more than one of them have turned into pieces of art. 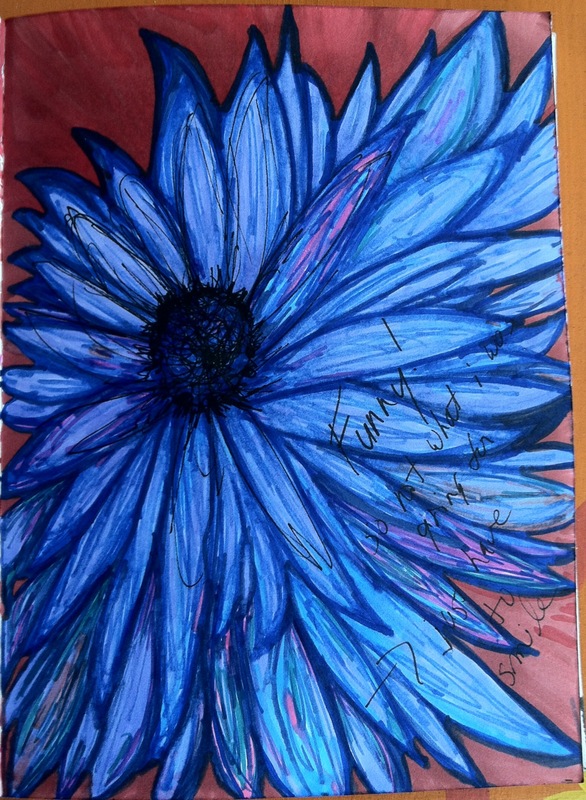 A failed attempt at a rose turned into a vivid blue sunflower bursting with life. 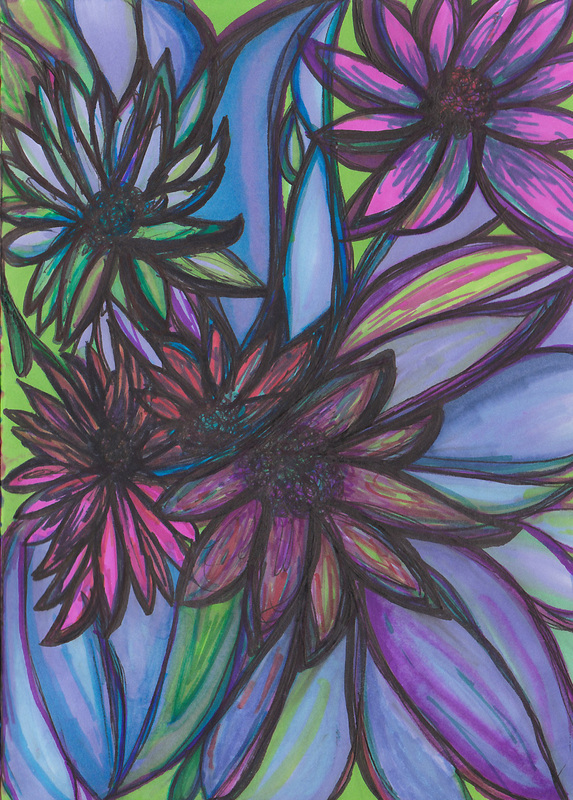 An abandoned flower peeking out from the corner of the page gave life to ribbons of color and light. Last night, after a particularly stressful day, I created this hypnotic web of colors out of an “X’d” out center of circles. I’m not sure if it represents emerging from the eye of a storm or feeling like I’m caught in a web. It reminds one of my friends of the “Wheel of Fortune.” I like that image, maybe if I give it a big enough spin, my winter of flat tires, power outages, and car repairs will end and the Spring will be full of prosperity and joy. As many people do, I struggle with seasonal depression – sometimes referred to as SAD. Mid-December when the days are short and the temperatures are cold the world around me becomes heavy and it becomes increasingly difficult for me to get out of bed in the morning. I’m fortunate because I understand what’s happening to me and can take action to lessen my feelings of sadness and anxiety. This winter has been more difficult than most; its extra cold and snowy and the sun seems to have run away to the Caribbean for the winter. I’ve no doubt that major life changes such as becoming an empty nester are also contributing to my feelings. The good news is the days are getting longer, I discovered light therapy, and a new outlet for sharing and engaging my creativity. A month or so ago I bought a lamp that mimics natural outdoor light and have been using it daily. I do believe the light therapy is helping. At first it seemed little strange to have a bright light shining directly on me for 30 minutes every morning and again in the evening, but now I’m used to it and almost look forward to it. I stumbled onto the creative outlet quite by accident on Google+. 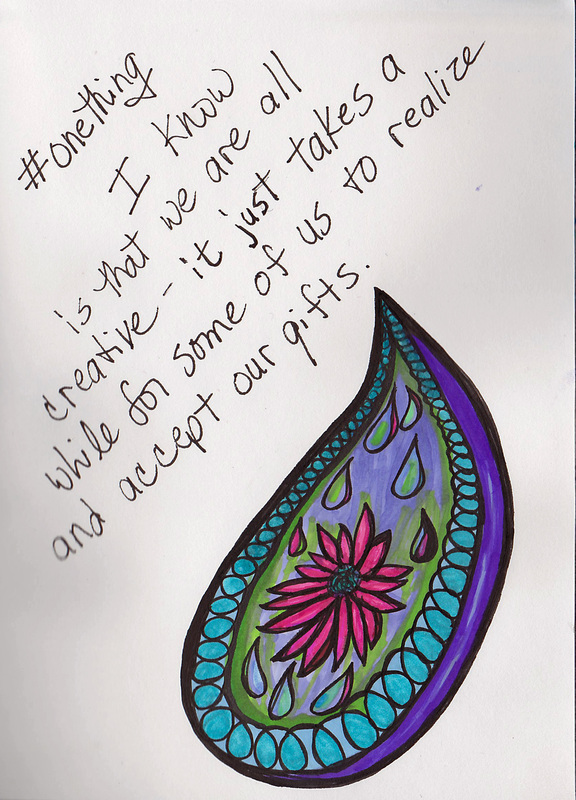 It’s called the #onething creative challenge and was started by Katherine Tattersfield and Drew Myler (you can learn more about it here). 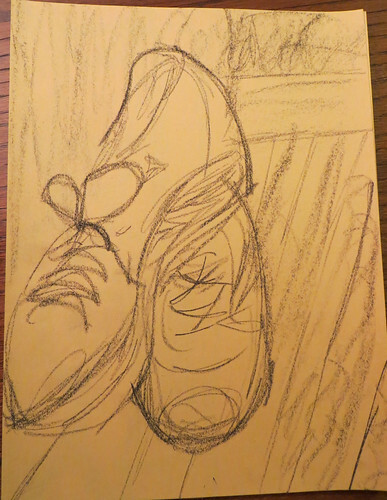 It’s self paced, anything goes and the goal is to create one thing daily, weekly, or whenever you get to it – it can be drawing, sculpting, writing, taking pictures, knitting, cooking…. etc. Then you post it in your feed using the#onething hashtag. I was inspired by the wide range of entries and the camaraderie among the participants. My first contribution to the challenge was my most complex and intricate ink journal entry so far. 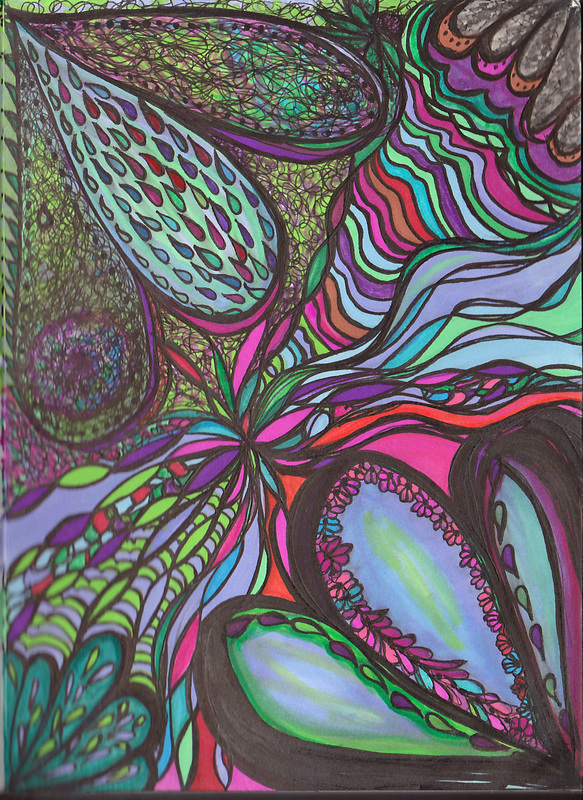 Undulate is the word that comes to my mind to describe the movement of colors and patterns through the middle of the drawing. 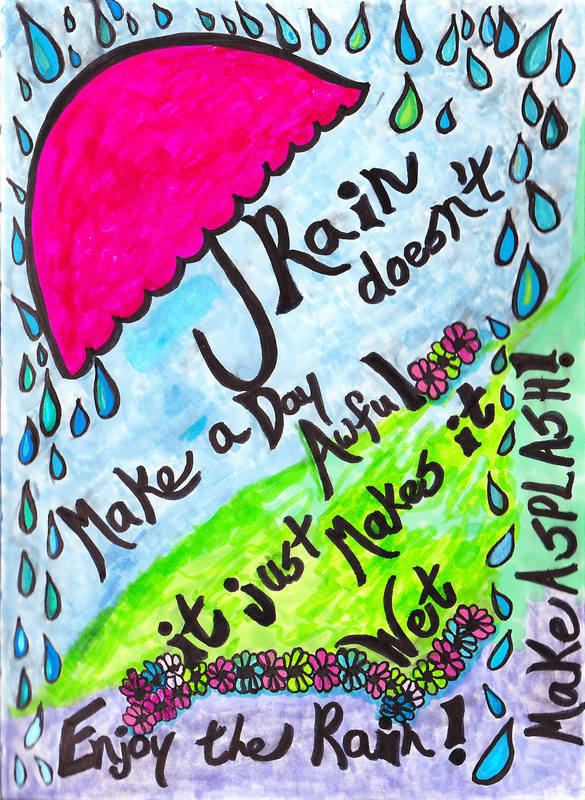 My second creation was a simple drawing in my journal accompanied with my sentiments about creativity. to realize and accept our gifts. The #onething challenge has already made a difference in my life. There’s a great energy among the people who are participating and it’s prompted me to once again take out my camera and take pictures of things that catch my eye. Many people don’t see or understand – is that there is inspiration everywhere, and often-times in the least expected places, like the pavement in front of the gas pump. 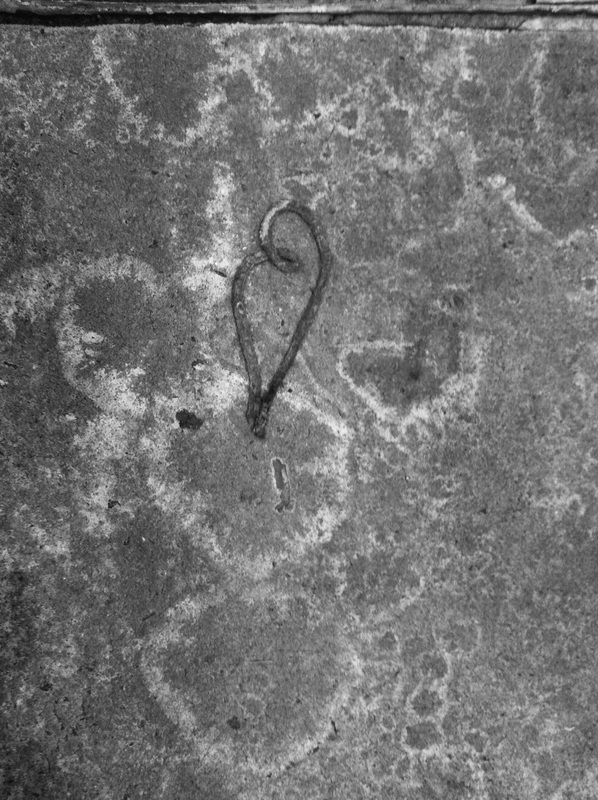 I’m not sure why there was this lone shoe-string curled up in the shape of a heart and abandoned in the asphalt – but it caught my eye and I’ve no doubt that it’s the inspiration for some really fun drawing. I took a deep breath before posting the picture from the gas station. The positive and supportive comments about the picture made my fears of being rejected, laughed at, or even worse ignored seem almost silly. But we all know how real those fears can be. 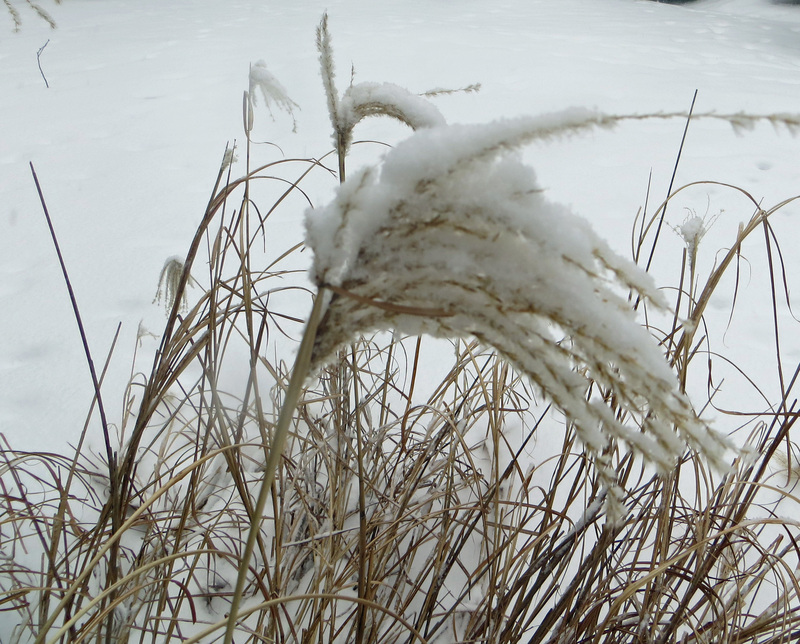 Yesterday was my fourth day of participating and the snow covered ornamental grass in my front yard was my contribution for the day. One person said it made her think of cotton candy. Today’s blog post will by my #onething for today. I’m not sure if I’ll be able to keep up the pace of contributing something every day, but it’s been a great spirit lifter. I’m thankful the days are getting longer, the sun is shining today and I’ve found one more thing to help me through the season and feel less sad. Hurry and arrive spring, I’m ready to take my camera out on the towpath again. Several months ago I was at Michael’s looking for inexpensive writing journals for my sometimes daily stream of consciousness. I found a few, one of which was clearly oriented around sketching and painting rather than writing. I wasn’t sure what I was going to do with it, but at $2.00 the price was right and I figured the inspiration would find it’s way to me when the time was right. The unlined pages of the journal intimidated me for months. 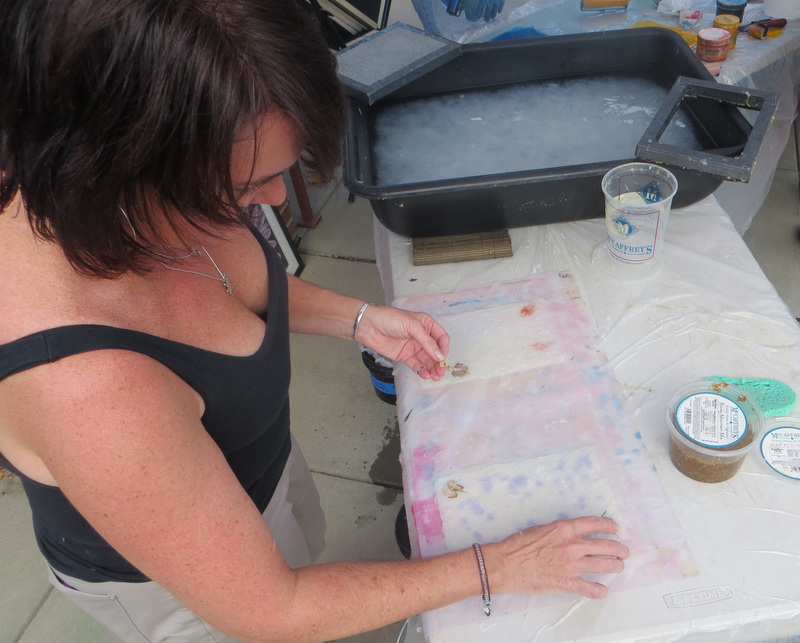 My only experience with drawing outside of a classroom setting was after I learned how to make handmade paper. 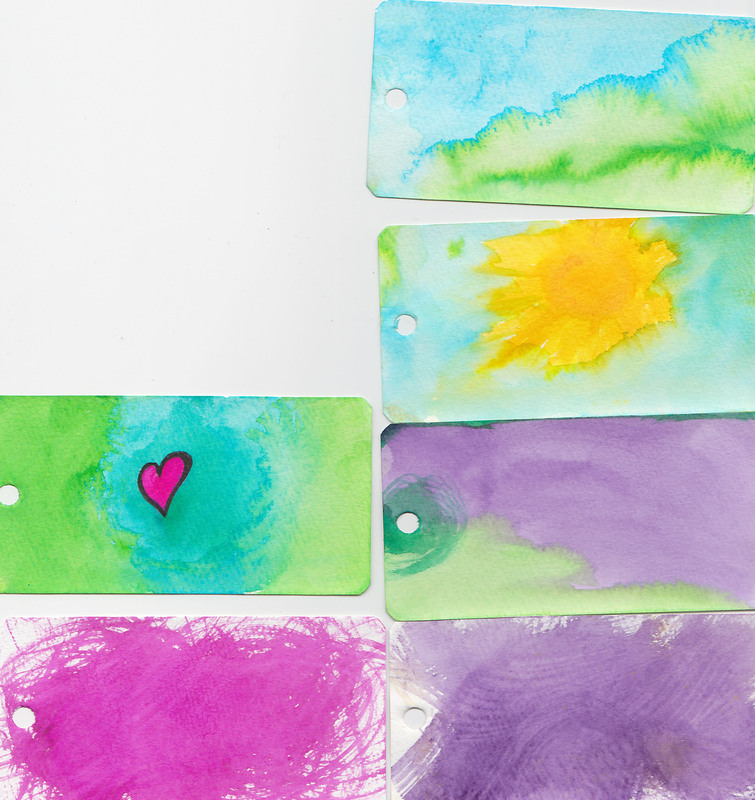 The pieces of handmade paper turned into tiny canvases and the imperfections in the paper were the foundation of many beautiful abstract pieces. I started using only black ink and sketching things that were familiar and felt comfortable to draw. 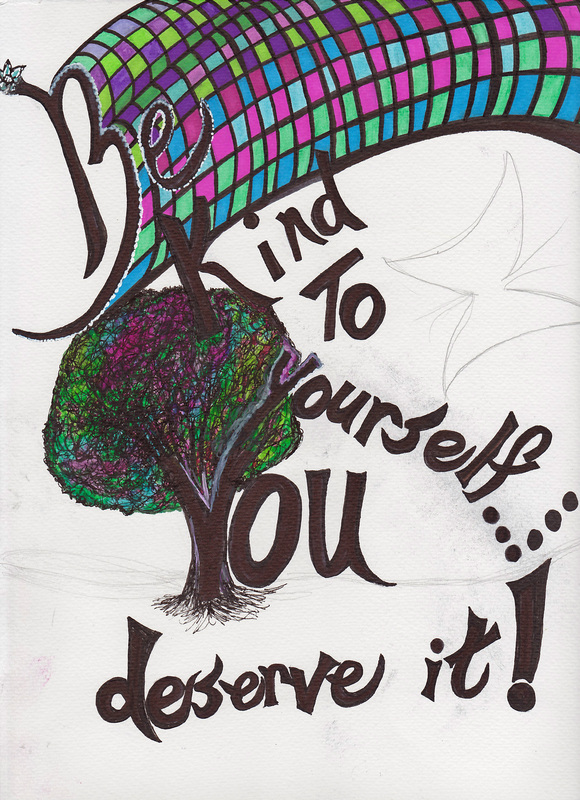 For whatever reason I drew trees, trees, and more trees. I don’t know what prompted me, but I was inspired to add color to the drawings and the trees took on the colors of fall through the use of watercolor pencils. 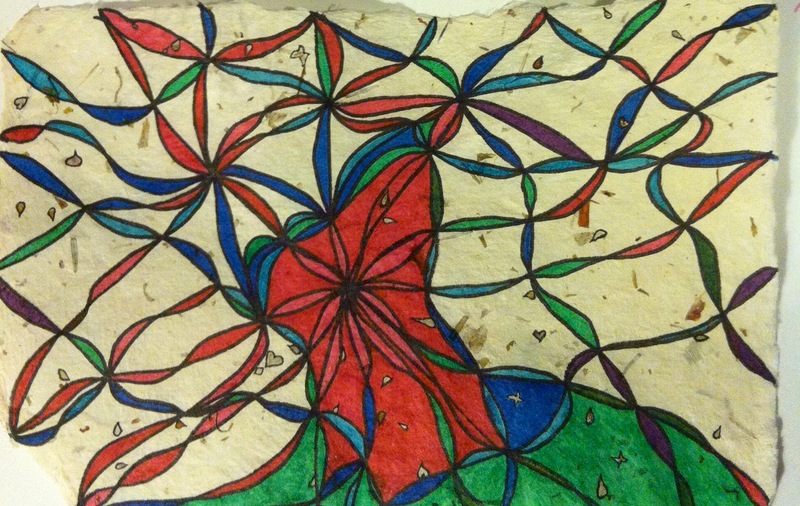 Even the most “perfect” pieces of paper were full of wrinkles, creases, and uneven textures. 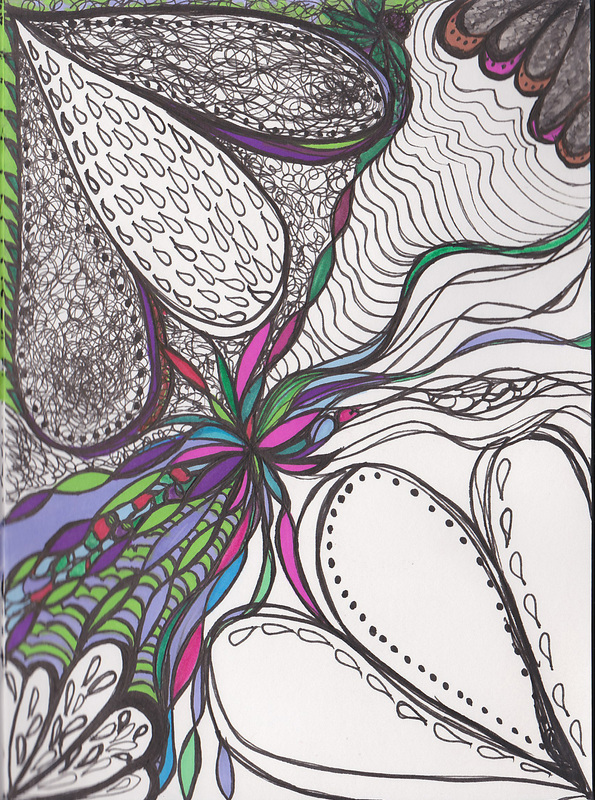 The veins and arteries that ran through each page were the foundation for the shapes that emerged from my pens. 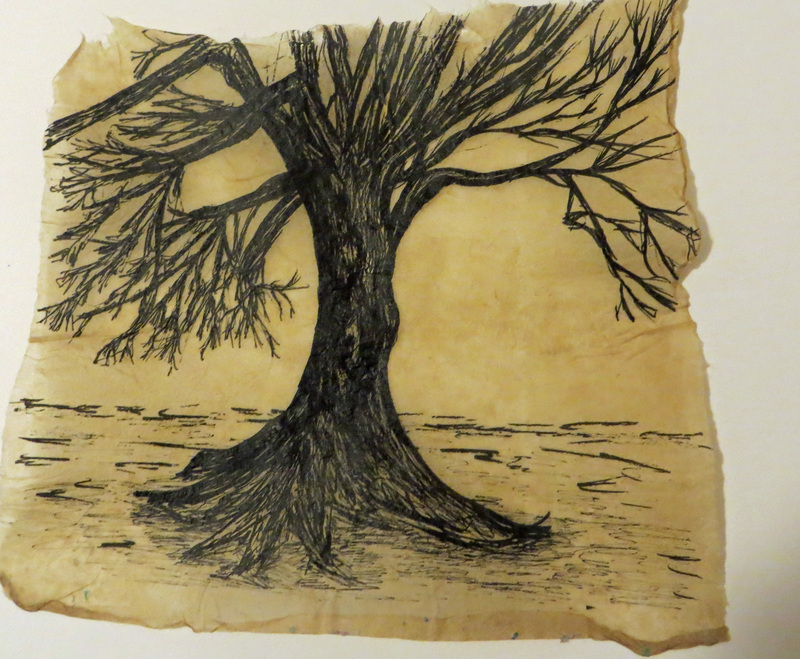 For a variety of reasons my creative self went into hiding after I completed my last ink drawing on handmade paper in March. Then one night in September an image came to my imagination so strongly I had no choice but to try and release it onto paper. 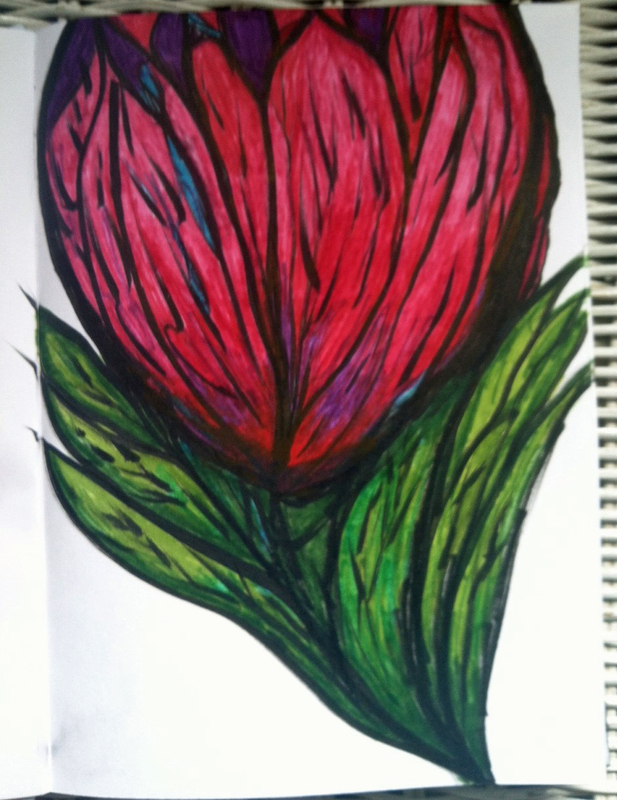 I was so thrilled with how my flower turned out that I stopped drawing again. I know that makes no sense, but it’s what happens to me sometimes. When I create something beautiful it makes me wonder if it was just a fluke and I talk myself out of trying to create something new just in case it was. The funny thing about my ink journal is that there are no dates and the entries are completed in anything but a chronological order. I’ve even given myself permission to do the unthinkable and use an abandoned entry as the beginning of a new piece. The backside of each drawing is almost if not equally as beautiful as the front; an unexpected and delightful bonus. 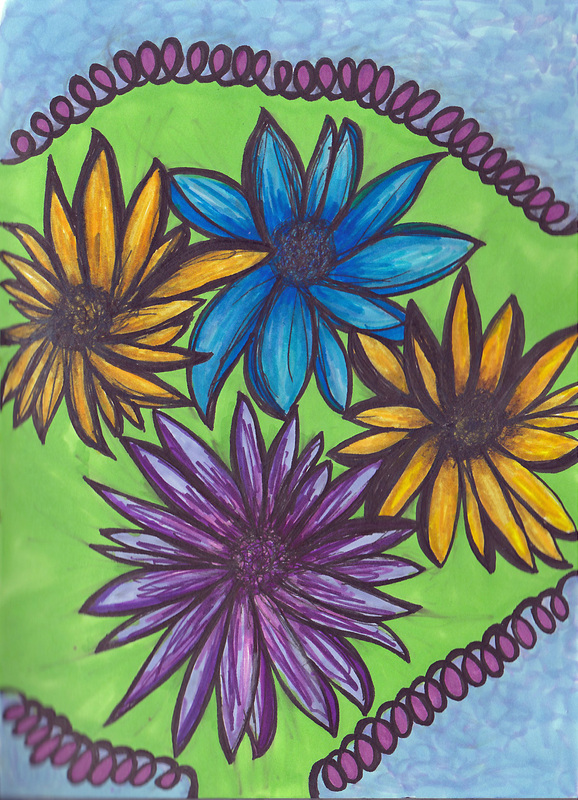 The recurring theme throughout the journal is sunflowers. 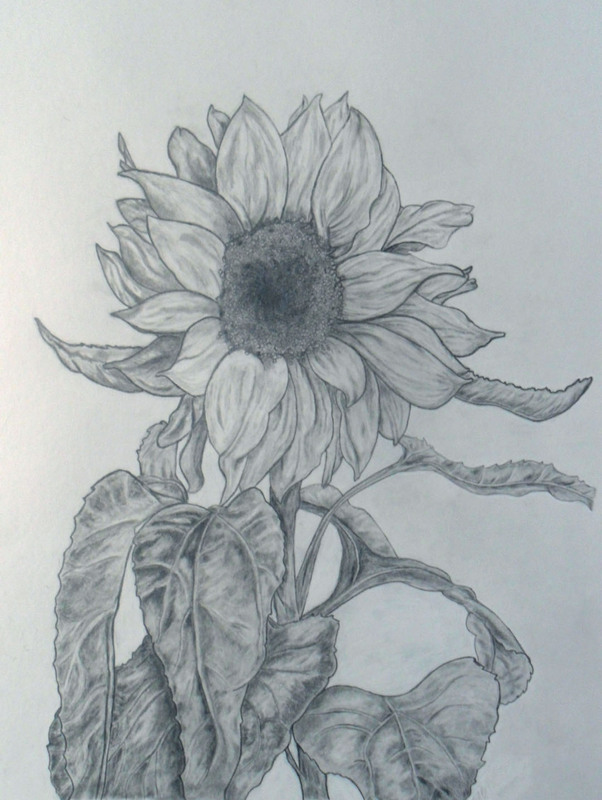 I’m not entirely certain if I continue to draw sunflowers because I know how, or because they were the subject of my first drawing, or because they are a symbol of happiness. Maybe it’s a combination of all three. I don’t suppose it really matters. 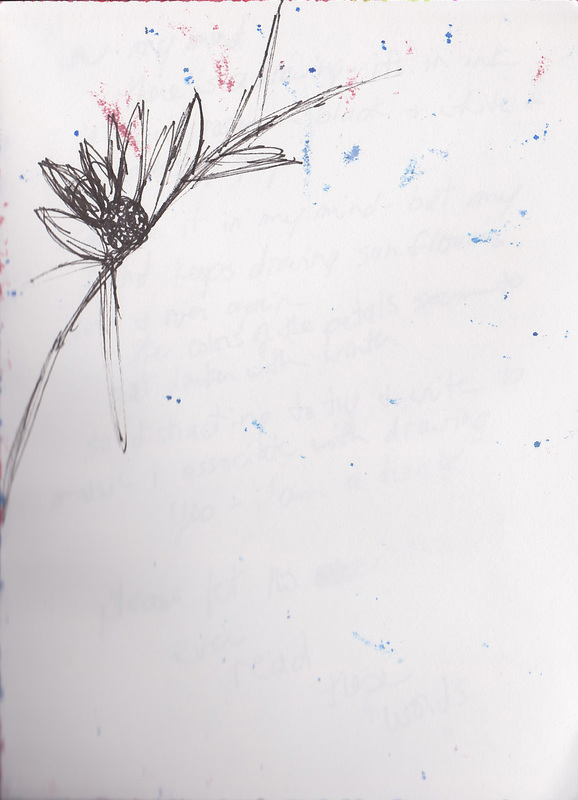 My ink journal is not a place where I create masterpieces or finished works of art. It’s a place where I let my mind wander and rest at the same time. It’s where I express myself without words with my medium of choice – ink. It is how I meditate through art. I can’t wait to see how my latest meditation piece turns out. Today I took a walk that was long overdue. It’s not so much that it was overdue from a physical fitness point of view but from a creative standpoint. 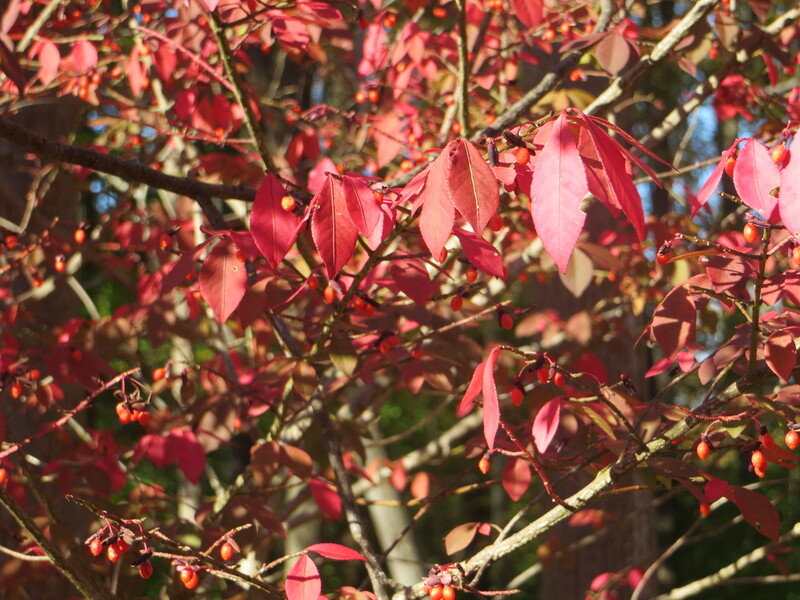 Since moving to Pennsylvania, one of my favorite past-times has been to go for long walks or bike rides along the Delaware Towpath and take pictures of things that catch my eye. I post them on Facebook, use them in blog posts, and I’ve even framed a few. In fact I was so excited about the images I’d captured and shared that I registered for a photographic essay class this summer. I looked forward to it with great anticipation. The class description invited beginners to learn about photography, it even said something that I interpreted as ‘no experience necessary.’ As a writer and a person who loves to take pictures it seemed like a perfect fit. Within the first few minutes of the first session I suspected I might not be in the right place. The instructor started off the class with a pseudo lecture about how smart phones and cheap digital cameras have degraded people’s appreciation of truly good photography. I gave him the benefit of the doubt and introduced myself as a writer, the owner of a cheap digital camera, and eager to learn about photography. I imagine he’s correct from a technical point of view, but it was meant to be messy – women and summer are messy, not organized or neat. 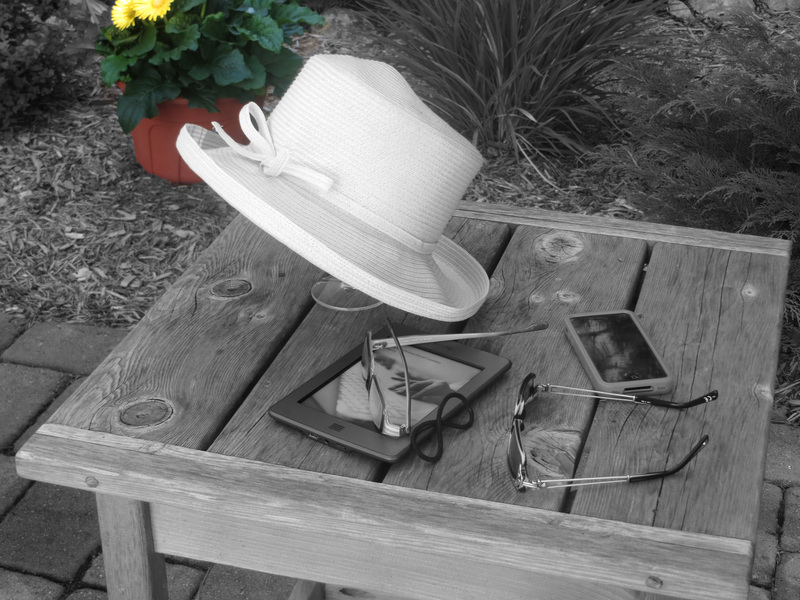 It was a slice of life and an un-staged moment that represented summer to me. Really? 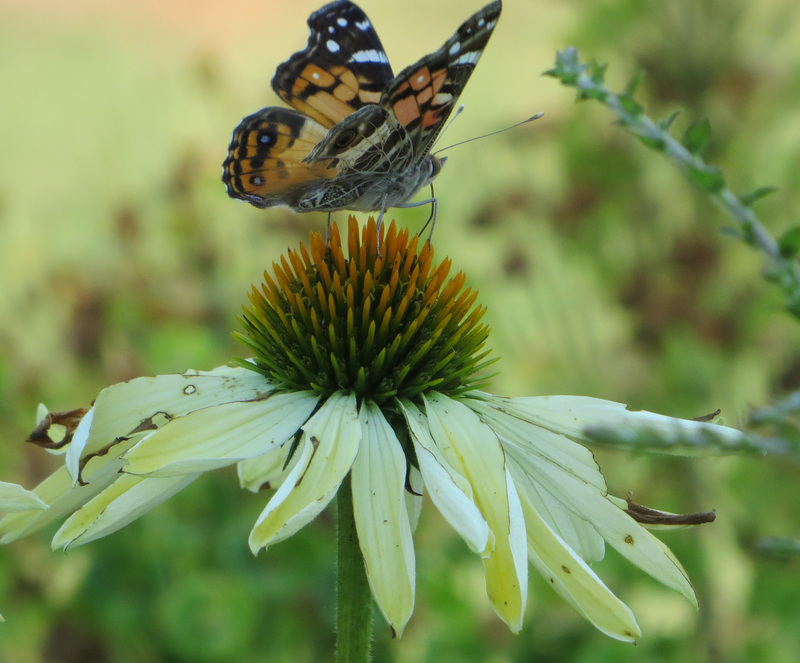 I’m not sure how I would have done that and still captured the butterfly. I won’t bore you with more, but it went downhill from there. I didn’t return to the class and my camera has been more or less in the drawer ever since, along with my pencils and charcoal. 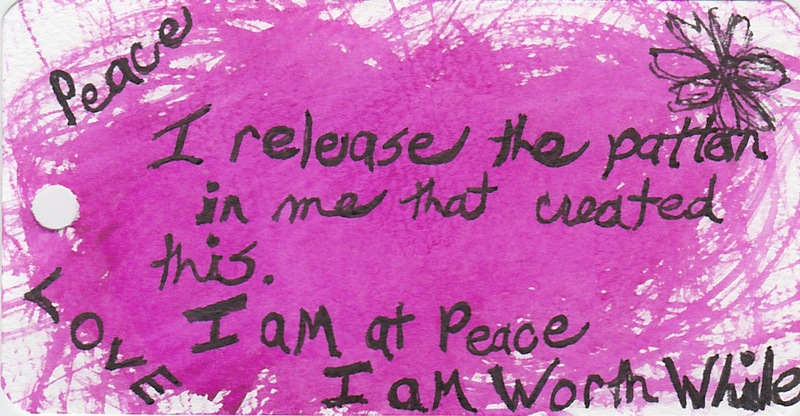 As an adult, perhaps I should have known better – but as a fledgling artist, I let him knock the wind out of my creative sails. Today, I decided to change that and I’m glad I did. I live in a breathtaking part of the country and my pictures are a way for me to share my world through the lens of a camera. I love capturing and soaking in the vibrant reds. I also love sharing my observations. This fall has been strange. 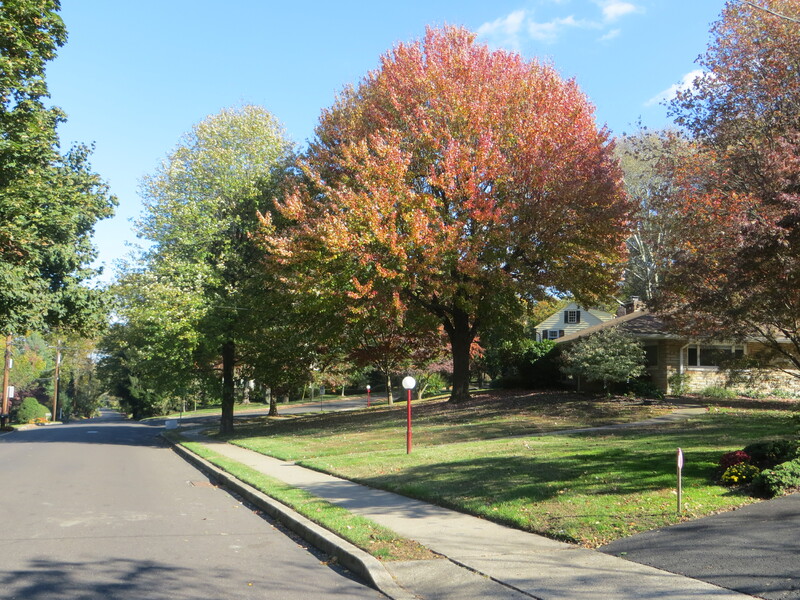 It’s October 27th and many of the leaves are still green. The contrast between the trees who have fully engaged with fall and those that are still holding onto summer is striking. 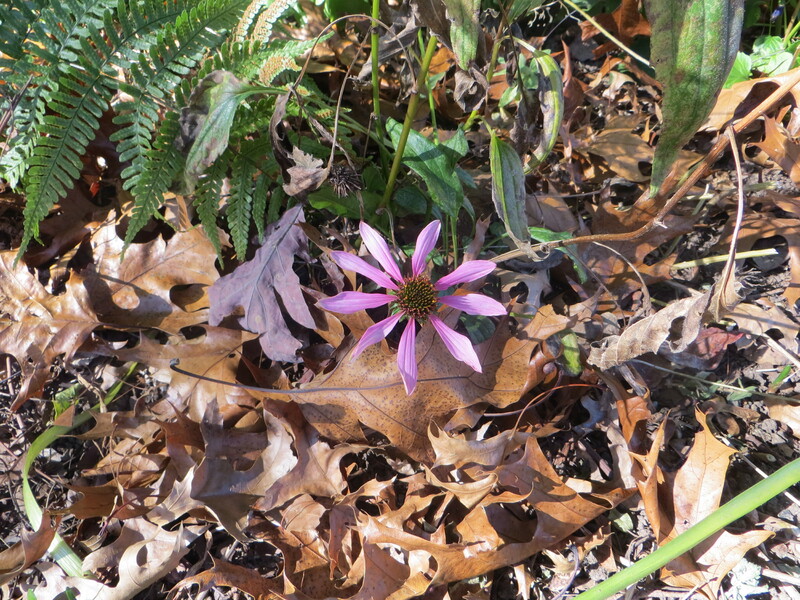 I spotted this small pink daisy (at least I think it’s a daisy) clinging onto summer and refusing to lose it’s last petals onto the crunchy layer of leaves below. 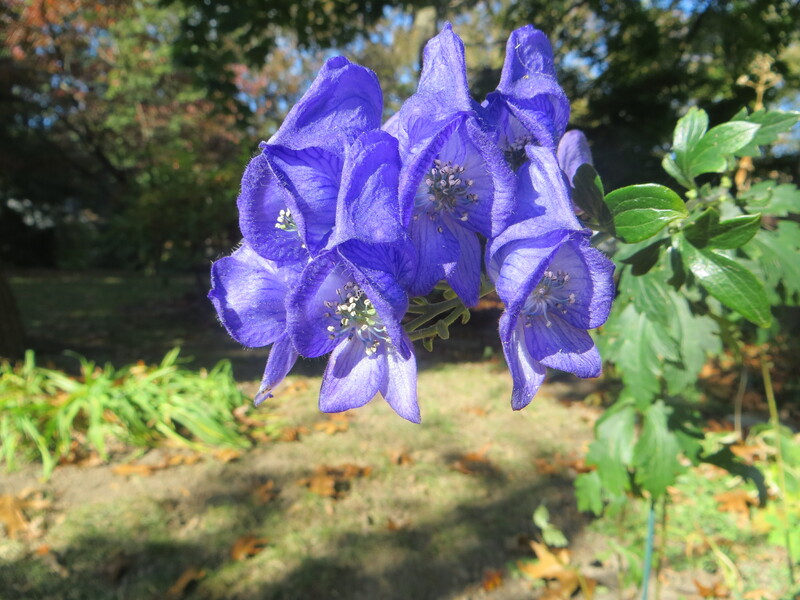 I have no idea what this purple flower is but I thought it was stunning and it didn’t seem like it fit into a walk on a chilly fall day. 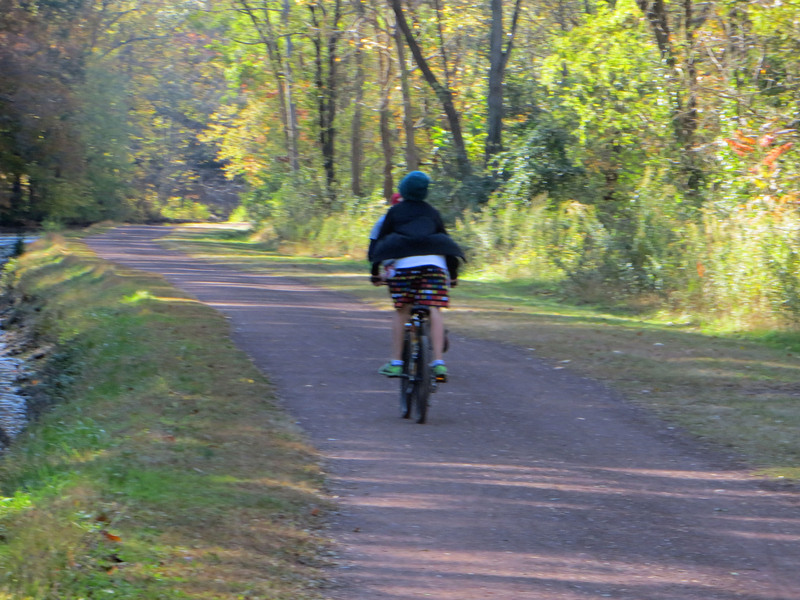 The towpath was alive with bikers and runners today. I laughed out loud when two young boys raced by me clad in boxers, sweatshirts, and neon sneakers. I had to wonder if it was a dare or a fashion statement. I hope it was a dare :). Normally I walk about four miles, today I decided to go further. Now comes the serendipitous part of my walk. I ran into one of the first people I met after moving here and I stopped to chat. We met through a local running group’s winter race series. I’d been thinking about participating in the series again, but hadn’t decided because I’m SLOW and the majority of the people in the running club are FAST (and I mean fast). Turns out she’d been thinking about the same thing – so we’re both going to sign up and it’s looking like I’ll have someone to go running with. 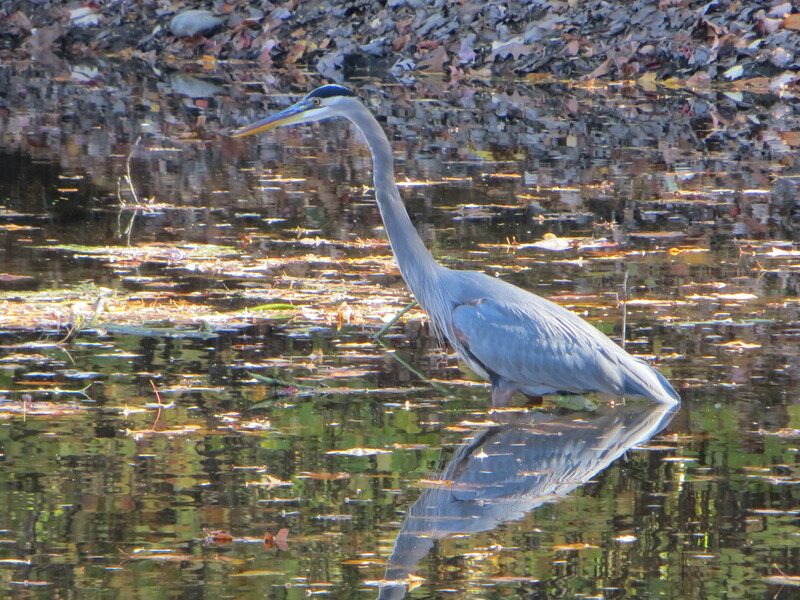 I grinned the whole way home and managed to catch this spectacular picture of a heron. I don’t know what the teacher from my photographic essay class would have to say about it, but I think it’s pretty darn cool. 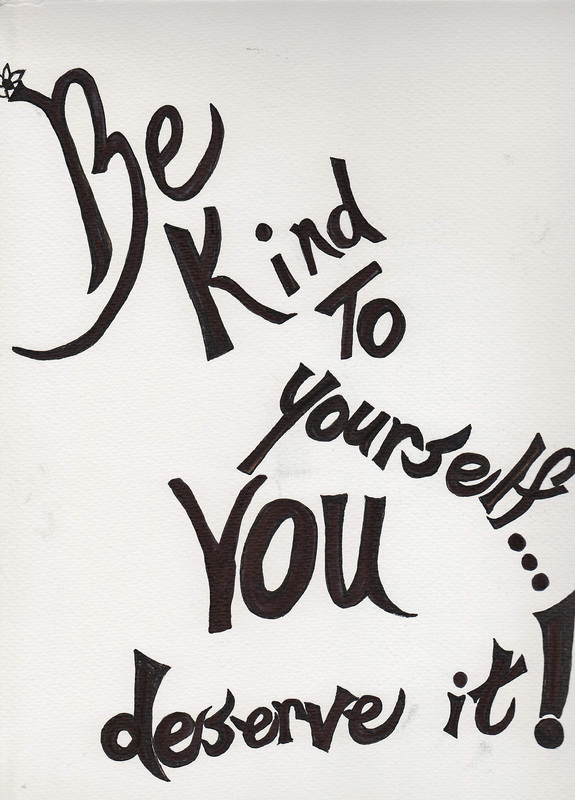 Even as adults, we rely on teachers to encourage and teach and challenge, not to criticize without being constructive. I’m deeply thankful for my drawing instructor who guided me into the artistic world with kindness, encouragement, and constructive feedback. The right teacher makes a world of difference. 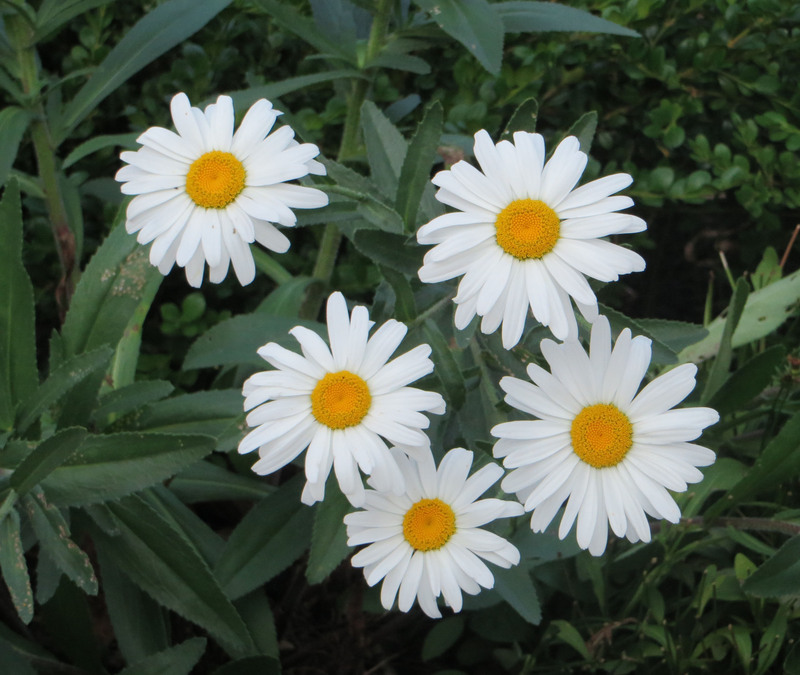 I’m not sure what the most serendipitous part of my walk was – but it’s been a good day all around. I’ve been off the grid (and out of action) for a while from an artistic standpoint. I finished a series of drawings and now I’m not sure what to draw, and I have no idea what medium I want to use. I do know that I love ink. I do know that I love charcoal. I do know that I love water color pencils. I do know that I love to combine odd mediums together and I think collages are wonderful. What I don’t know are the basics – I’ve never taken a basic drawing class. 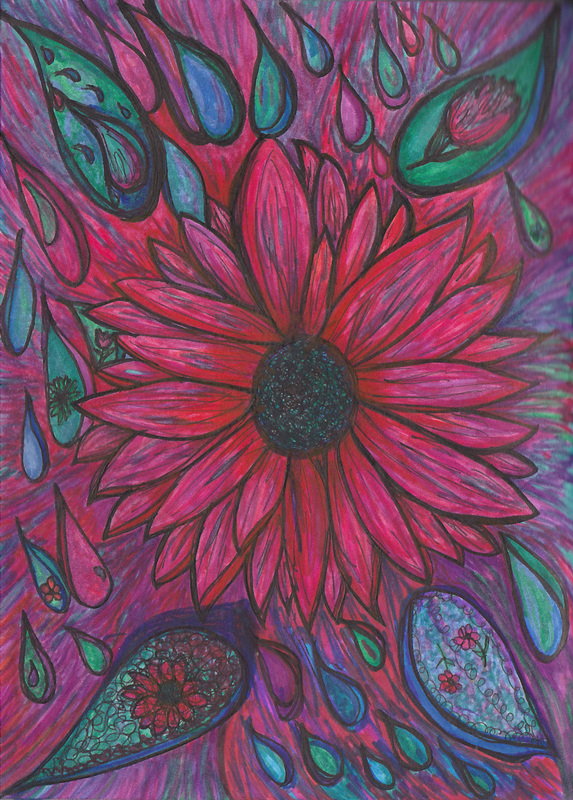 When it come to art classes, I jumped from being in third grade to being a 50 year old taking an intermediate class that involved learning how to draw a sunflower and capture the intricacies of shading. I had no idea that there was such an ability inside of me. 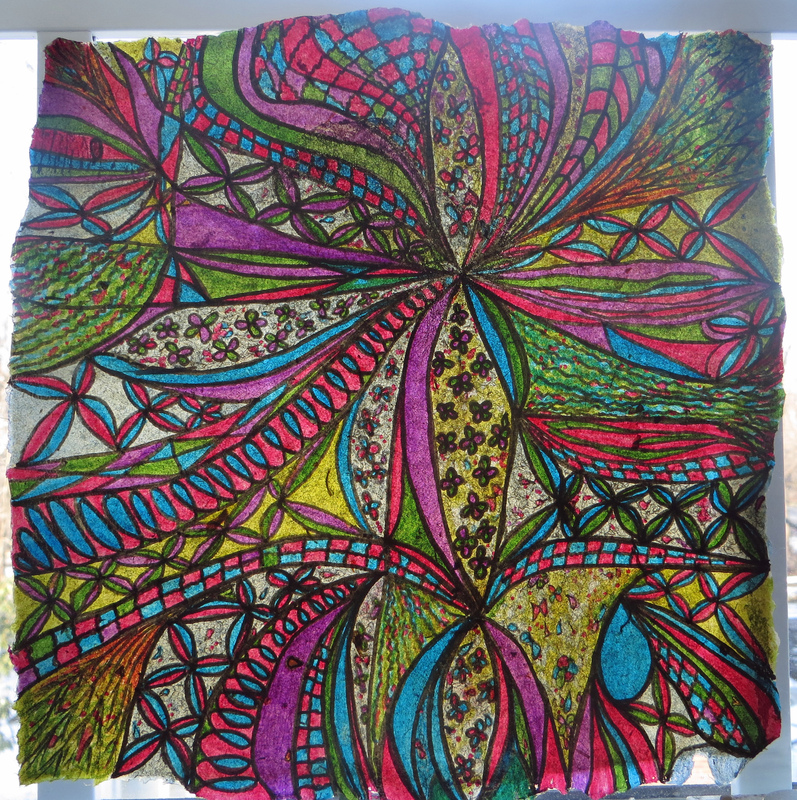 And then I drew some more – my drawings became very abstract and I think my feelings poured out onto my handmade paper, through black ink at first and then through water color pencils. I swear I’m addicted to the permanency and the vibrancy – it’s very counter intuitive for a perfectionist to love a medium like ink. Once you put it down on paper, there’s no turning back. I finished a series of ribbony dresses on hand made paper. It’s a big question for me. Since completing my last project, I’ve felt completely uninspired. A childhood friend and very talented artist gave me some food for thought recently. 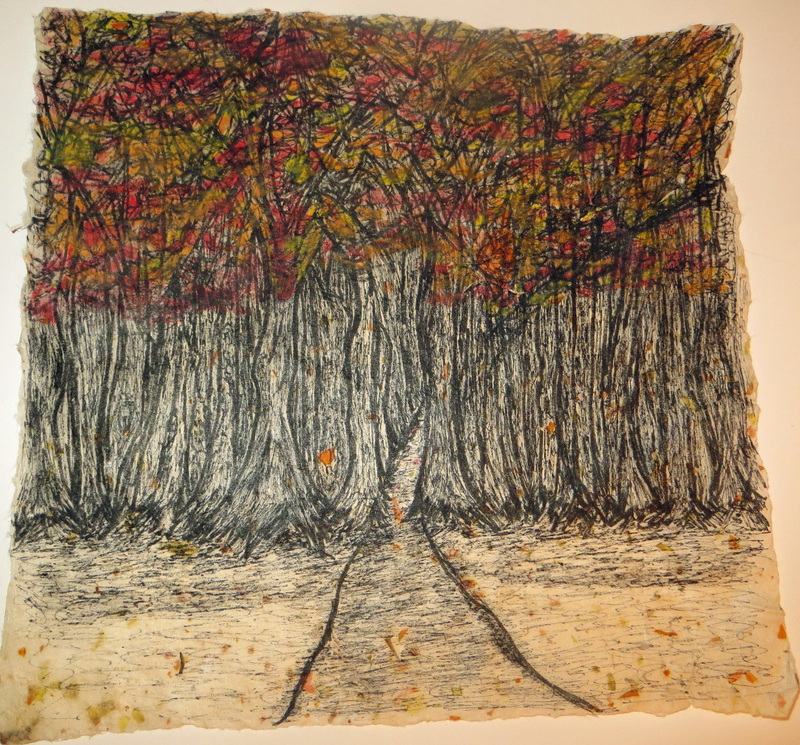 His observation was that my drawings had become formulaic – hmmmm. Truth is, that when it comes to drawing, I feel like I’m a stranger in a foreign country. It’s like I can speak the language, but couldn’t read a street sign, newspaper or book if I had to. As a result I feel completely lost unless I’m drawing something very abstract or someone is guiding me along the way. “You mean, just draw? Draw something that’s unfinished and imperfect? But I hate creating imperfect things,” I replied. It was sound advice and I think the sneakers count. 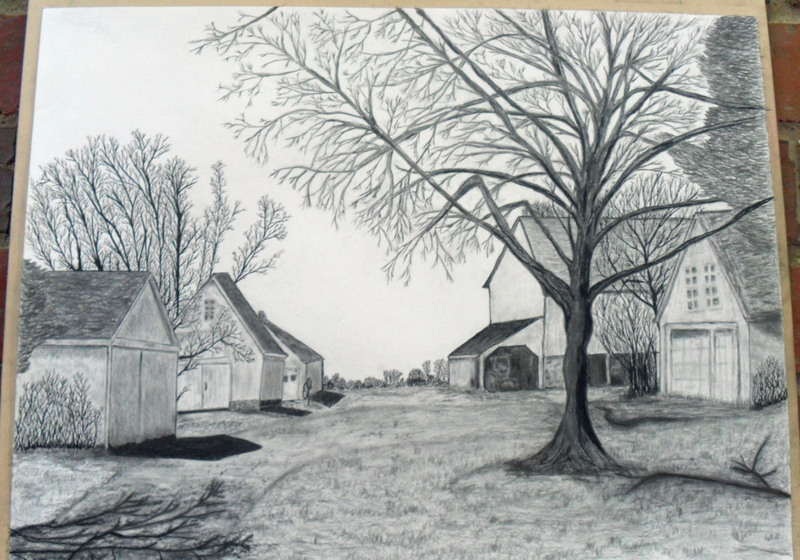 I’ve registered for a class that fits the photographer and writer in me, but doesn’t advance my drawing. 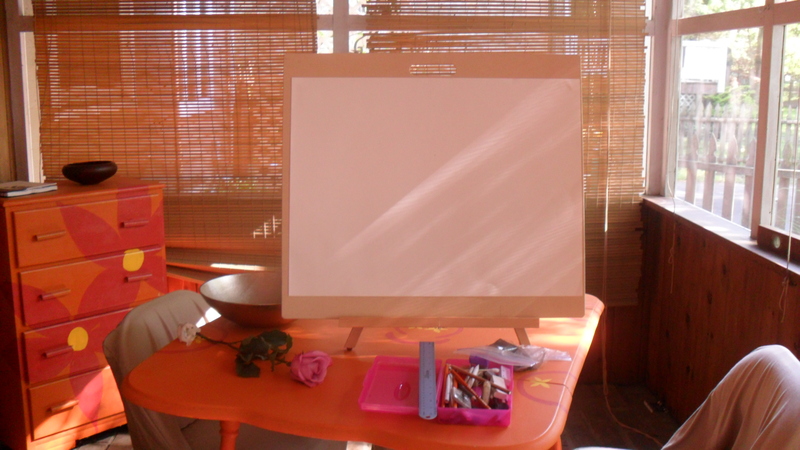 I can’t wait for the class to start, but I think I’m also going to seek out a beginning drawing class to take this fall. It seems like some basic training might be in order and would help me feel more at ease with the concept of drawing. In the meantime I’m going to take my friend’s advice and “just draw.” I think it’s time I turned my porch back into a summertime studio.